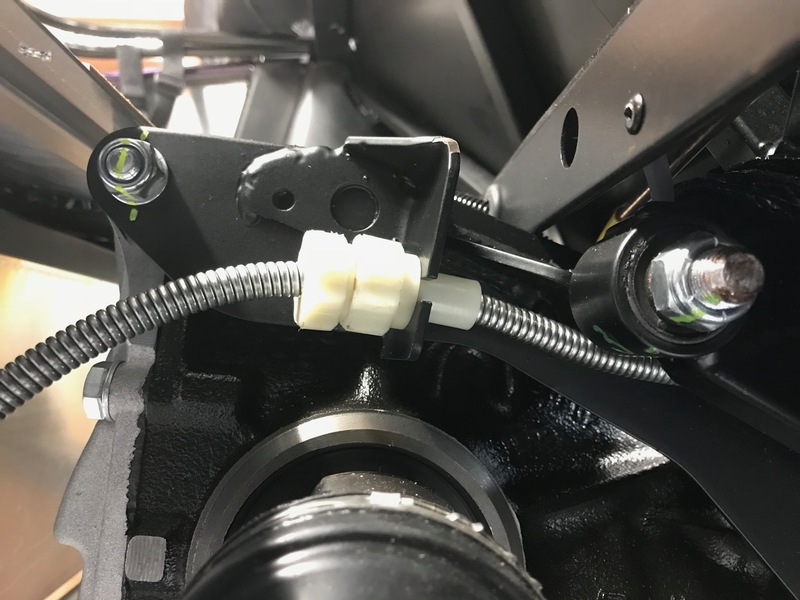 Having seen a couple of pictures on other people’s blogs, it was clear that the handbrake cable adjustment screws should be located in the clip on the RHS of the diff. I’m not sure what I was thinking that it stay in the transmission tunnel – definite brain-fade there. Once I’d decided where the adjustment screws went for the cable it was obvious that you have to used the bare middle section of the handbrake cable to feed the cable from the rear of the car into the transmission tunnel. You pull the thin middle section back behind the diff, slot it into the clip and then feed that and the thicker outer forwards into the transmission tunnel. Simple when you know how. 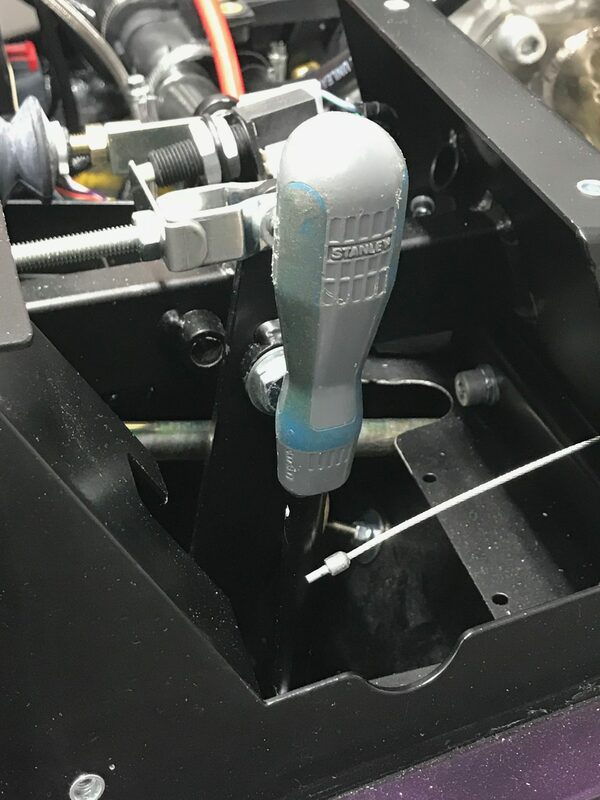 I left all the handbrake adjustment very loose so that the handbrake lever can be raised so it’s upright… this allows the transmission tunnel top to fit easily over the handbrake and gearstick. Another day, another screwdriver down the drain?? It seems some people wait until they can apply the handbrake before tightening the propshaft bolts. It’s also possible to lock the rear hubs with something across the wheel studs. But… I went back to the screwdriver method. Overnight I’d re-read that others had done this successfully and I was going to give it another go. With my second least mankiest, crappiest, big screwdriver I went about trying to jam the propshaft in place again with the big screwdriver method. This time success. I was much more careful not to get the square section of the screwdriver rotated so it didn’t slip into the universal joint and jam against the chassis. All four bolts went in and got torqued up easily. In between my frustrations yesterday I’d also got the De Dion tube going. I did a lot of the dry fit yesterday but decided to write it up in one go today – that should make it easier for people who just want to read one post about the whole of one thing. The dry run was fairly straight forward once I wrestled with the tube – but more on that in a minute. 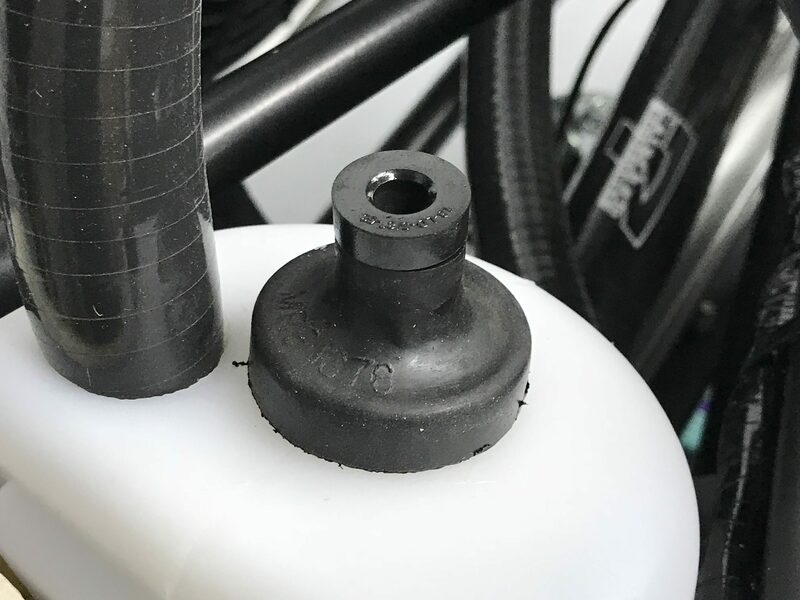 I’ve read blogs where people get confused about what bolts go where on the rear hub/ear installation and how they attach to the De Dion tube and drive shafts. However, I found the manual to be perfectly adequate – I suspect the manual has been updated since those blogs were written. I had certainly read some posts where people had used some well annotated photographs showing what sized bolts went where. But I found that in the end I didn’t need them. It was pretty obvious from the build manual and the physical setup of the hubs which bolts to use. 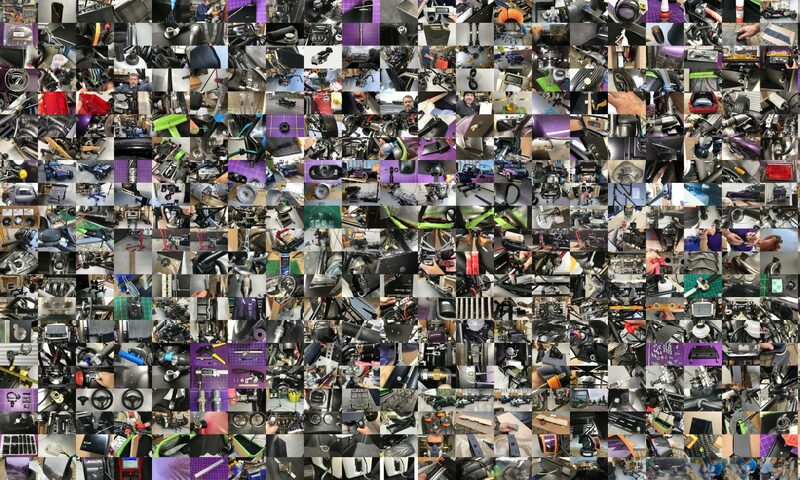 You do get a lot of bits and pieces though! What wasn’t so easy was finding a way of keeping the De Dion tube the right way up for the test fit. There is a triangular section protruding from the bottom of the De Dion tube where the A-frame attaches to it. This has to be pointing downwards so you can do all the work to fit the brake pipes on top of the tube. But of course that means that if you don’t hold the tube vertical it just wants to roll off the triangular section and not lay vertical. I’d seen others use a Black and Decker workmate to clamp the a-frame mounting point and keep it pointing downwards. My workmate was buried in my office in the garden and so I tried to “make do”… big mistake. In the end I created two towers for the assembly to be clamped between (see below) but it would have been soooo much easier with a Workmate. Once you have the rear ears and hub loosely fitted to the De Dion tube you have to dry fit the rear copper brake pipes. You fit brass brass t-piece and then the short and long pipes. 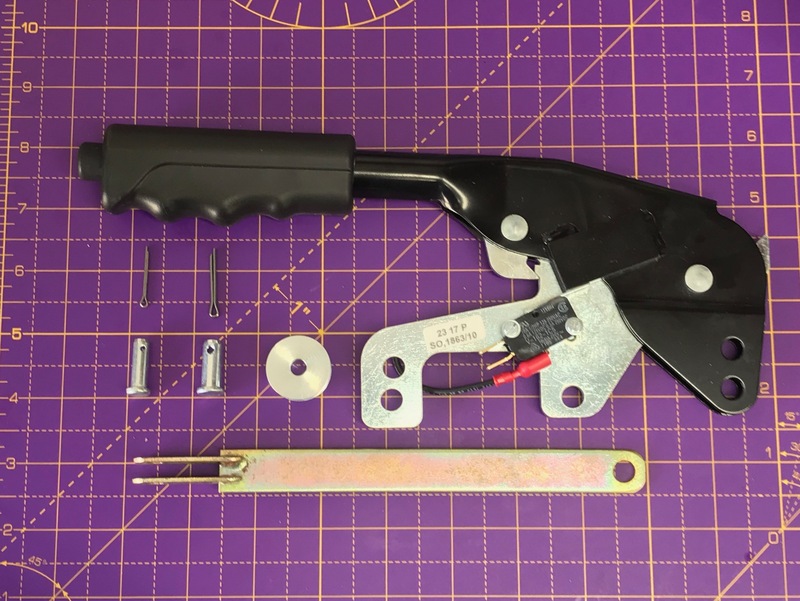 I found I had to drill out the holes in the De Dion tube that take the rivets but that was fine, even after breaking the only imperial 1/8″ bit I had. 4mm seemed to work fine. The shorter RHS brake pipe seemed to work out fine. I had bought some small diameter pipe benders but in the end didn’t use them. I found it just as easy to bend the pipe around a largish diameter socket – taking care of course not to pinch or kink the pipe. Somehow the RHS pipe all just slotted into place. The pipe bent nicely around the radius arm bracket and was clear it wouldn’t foul as the suspension moved. The shorter RHS brake pipe worked out well. I then put the LHS pipe in place and it looked as though it just wasn’t going to work. I eventually got it fitted but wasn’t happy about how the last section just seemed to take a short cut. This LHS brake pipe shortcut doesn’t seem right. We’ll have to see how that works out in practice when we get the De Dion tube fitted. (Another) Big mistake. Should’ve taken more time on this one… but to my defence I didn’t know what it had to look like and so put up with a bad job! Note from the future: Two problems here. Firstly the pipe needed to be bent so it was following the tube around the front of the radius arm fixing point (the two flanges). Secondly, the bend of the brake pipe closest to the t-piece was too tight. I had to make the zig-zag less shallow to give me more pipe to play with at the wheel end. And I had to do all of that with the De Dion etc all in the car! More on that when I get to that later. It’s a simple job to fit the rear ARB bushes to the ARM… lots of PTFE lubricant and they slipped over with the help of a screwdriver. I only loosely fitted the ARB chassis mounts. It seemed I might need to have a bit of wiggle room later when fitting hubs and tube. I’m not sure if I needed the wiggle but it was simple to tighten up the ARB mounts later. Next up was to fit the rear flexible brake hose. 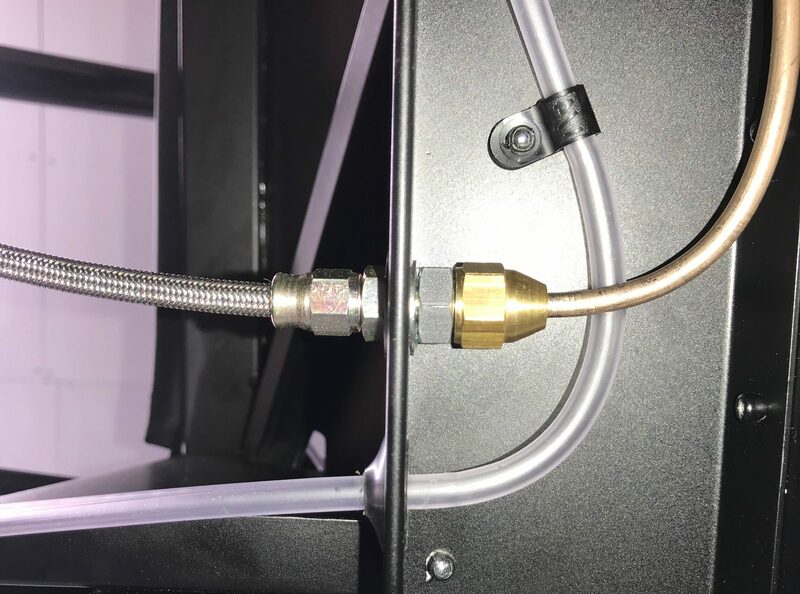 It was a little tricky to get the screen wash pipe out of the way while attaching the flexible hose to the copper pipe going forwards but it was all perfectly do-able. I’m still a little unsure about how the handbrake cable is going to route around the drive shafts, diff and flexible brake hose. I’m sure that will need some re-jigging when I get around to tidying things up later. 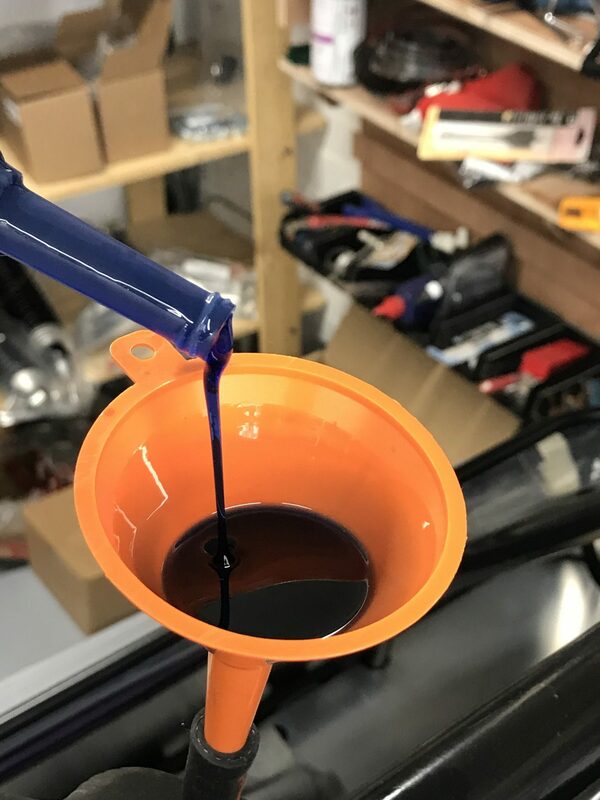 So I’m in no rush to put any brake fluid into the car, and like the engine bay plumbing, I want to get everything onto the car and in the right place, with the right routing, before I put any fluids in. I was very glad of that approach in the engine bay and see no reason to rush fluids at the rear either. 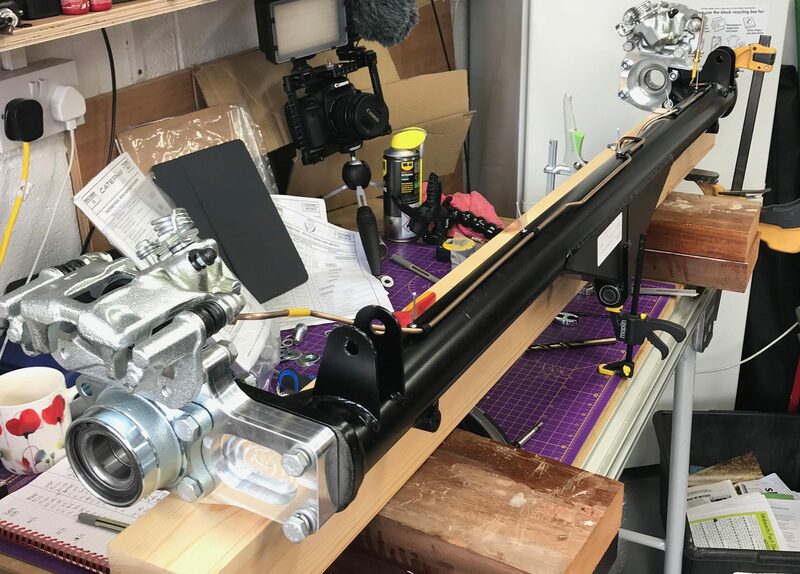 The last job today was to place the De Dion tube into the chassis… of course after removing all the loosely fitted rear hubs, callipers and mounting plates. 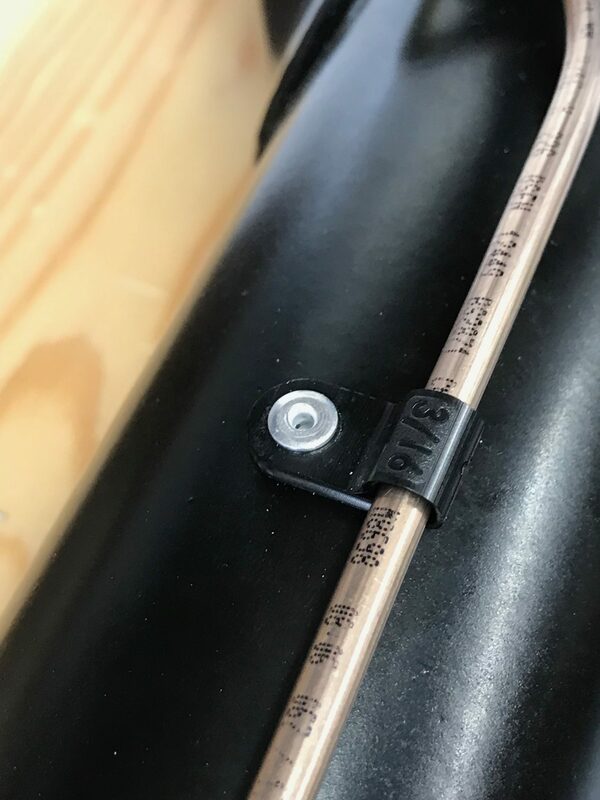 The brake hose pipes are attached to the De Dion tube at this point so you have to be careful not to damage them as you slot the tube into the chassis. The car is supported on axel stands resting on the chassis tubes. I put pipe lagging (from the engine bay) to protect the tube and rear chassis members and just lay the De Dion tube onto the lagging. At this point it’s possible to fit the rear dampers and springs. Because I’d already fitted the Roll Over Bar, I was able to fit the rear dampers too. The manual seems to indicate you do this later because the roll over bar comes later. But IMHO, the roll over bar should be fitted before getting to the rear suspension. 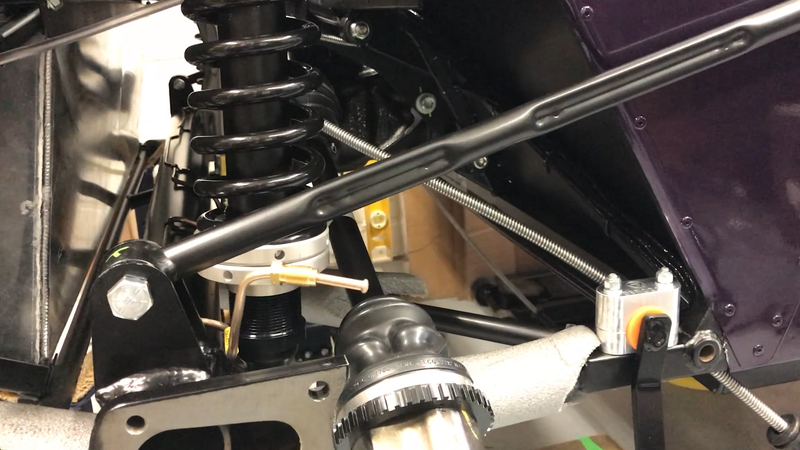 This is only a problem if you have the track roll over bar, seeing as there’s an extra bolt that goes up through the chassis and bodywork that you can’t get in once the damper is in place. Note from the future: having talked a bit to some other builders it seems that some people like to replace the rear fixed copper brake pipes with flexible hoses running from the t-piece to the callipers. Caterham sell the parts and kit to do exactly this conversion, but only for the narrower S3 chassis. The conversion is a requirement for the race cars but is something road users also do. 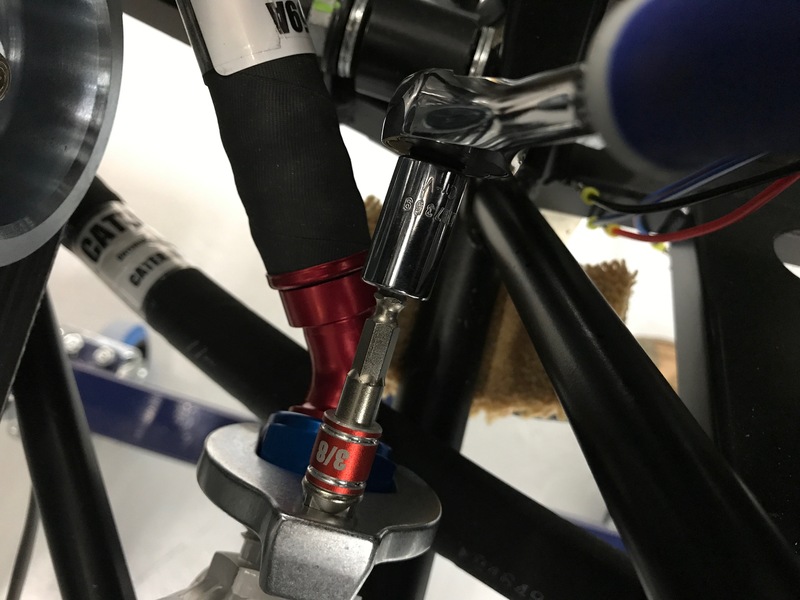 I suspect its required on the race cars because the flexible hoses offer greater protection to the braking system than the fragile copper pipes do. It also means you’re not bending copper pipes so much if you’re changing brake pads a lot. Unfortunately, they don’t do the parts or kit for an SV chassis. 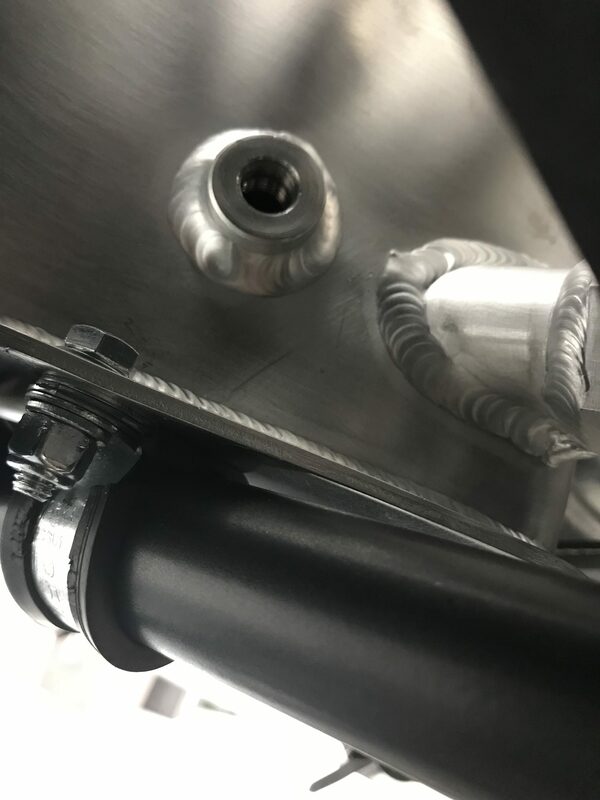 However, you can find web sites where the parts can be “built up” with the right couplings and threaded ends to the right length hose. I’ll do this at some point when I have time to drain the brake system and/or I need to change the rear pads… not particularly something for the short term unless I get bored over a winter. The radius arms fit between the De Dion tube and holes in the bodywork/chasis at the rear of the door apertures. The location of the radius arms at the front determines a ride harshness (I think) vs rear wheel control tradeoff. There are two holes that can be used for the Radius Arms at the rear of the door openings, an upper and a lower. The lower hole is for more of a track setup and the upper for road use. The lower hole is not fully drilled out so I decided to go with the simpler option and used the upper mounting holes. I waited to torque the bolts of the radius arms like the build manual recommends – the rear suspension needs to be bearing the weight of the car to correctly tension the suspension when the bolts are torqued. Another one of those bitty weeks. Not much time to really get my teeth stuck into anything but got a couple of odd jobs done. First off was a go at the battery earth leads…. The build manual only talks about the first two of these connections. It says to attach the battery-to-engine earth lead from the battery to the bell housing. I guess this makes sense but I didn’t want to undo the bell housing bolts just to put an earth lead on. There was a similar logic going on with the engine mount (LHS chassis) to engine earth lead. The manual suggests attaching this to the engine mount strut on the engine. 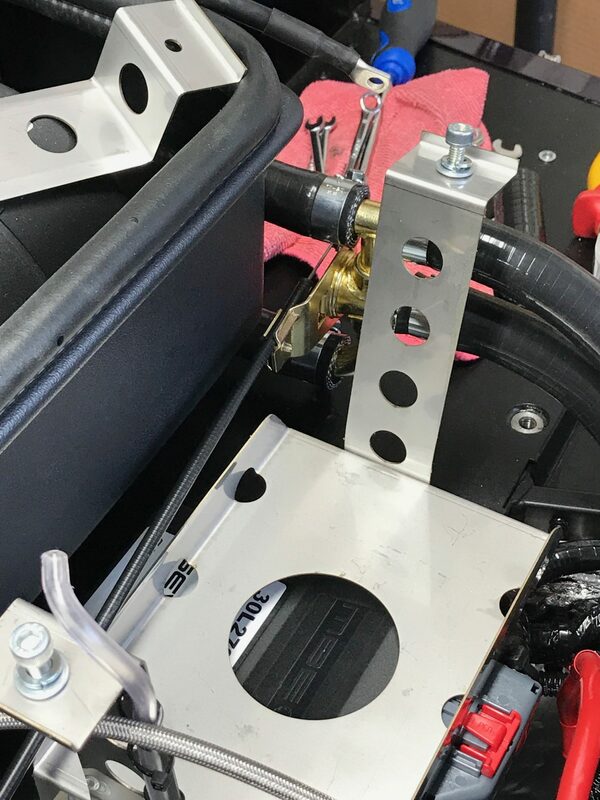 That’s a perfectly sensible place to put it… and in the absolute cause of “adding lightness” I can see that using existing bolts for both the bell housing connection and the engine mount connection makes sense. However, two extra bolts is not going to break the bank so I decided to use existing empty holes in the LHS of the engine and to connect these two earth leads there instead. I’d taken delivery of some M8 cap head bolts this week so it made sense to get these leads fixed up one evening (one was M8 the other M6). Earth connection from battery to engine block using a spare threaded hole on the LHS of the engine. This is the high current connection. A note from the future: after talking to Andrew Pepperrell about his build… he had got to the earth lead bit and wasn’t keen to undo his engine mounts to attach the lead either. He asked Caterham what to do and was told that the LHS engine mount earth lead was not strictly necessary. 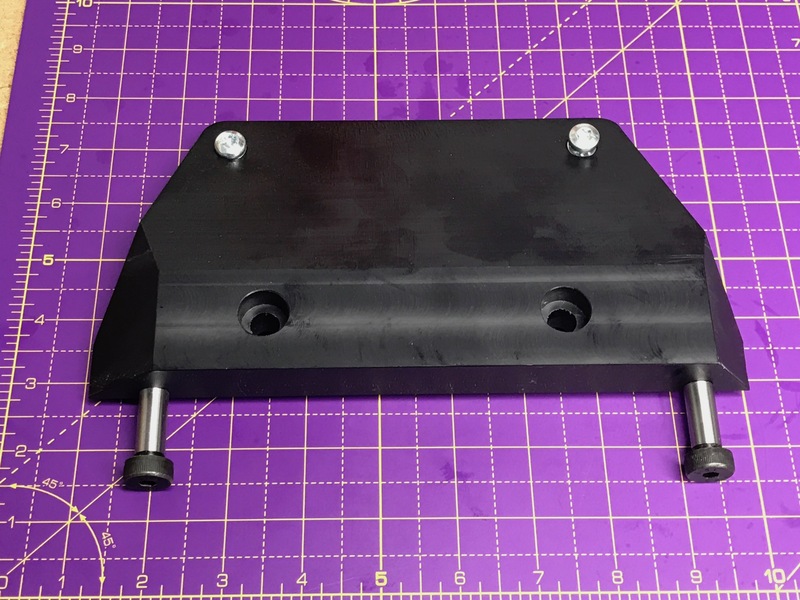 I can certainly see that having multiple connections to the chassis is not a requirement, but since I had decided to go with the belt and braces approach I didn’t see the need to remove anything. There’s also the third battery lead to connect these days. The build manual doesn’t talk about this lead but I’d seen it connected on the few 420’s I’d managed to take a look at and I guess Caterham have their reasons. It c certainly would save the effort of stripping the paint away from the chassis engine mount. 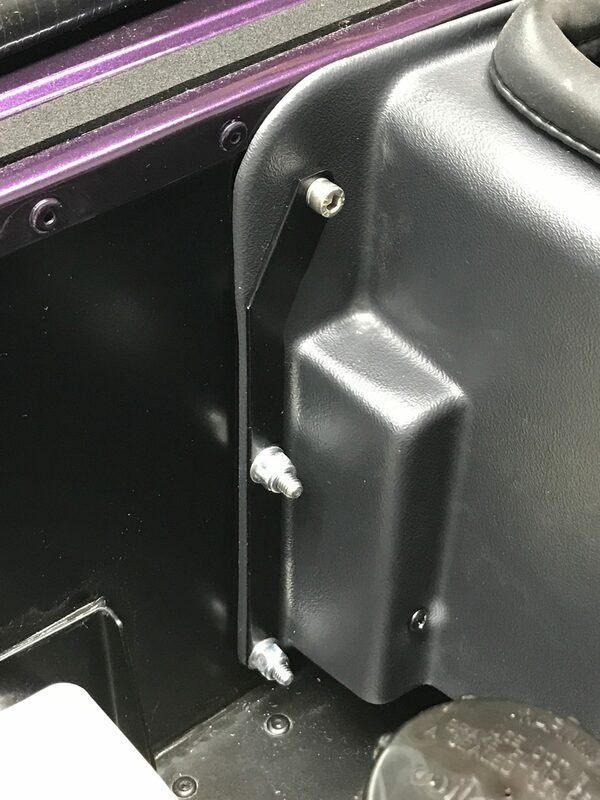 For this third lead it connects from the battery negative to a spare threaded hole where the pedal box would go on a left hand drive car, ie above my passenger side footwell. 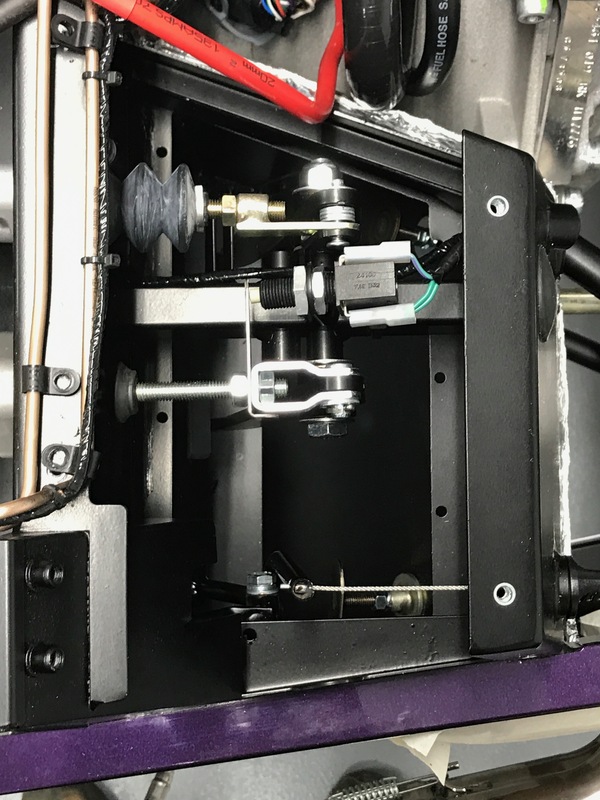 To finish off the discussion about earth leads… I’ve talked about this before… A good earth to the chassis is cleary important – either directly via the LHS pedal box mount or indirectly through the battery to engine and then engine to chassis mount. However, the highest current path on the car is the circuit made up through the battery and starter motor. Therefore, its important to get low impedance (low resistance) connections from the battery to engine (earth connection) and the battery to starter motor (12v connection). The starter motor “earth’s” itself through its casing directly to the engine – so the current used by the starter motor to start the car flows from the battery positive terminal, through the cut-off switch, through the starter motor, then through the engine block and finally through the battery-to-engine earth lead back to the battery negative terminal. For those readers that are not electrically minded that means you need nice thick red (12v) cables for the connections on the battery positive, through any cutoff switch and then to the starter motor. And… you need a nice thick black (0v) cable from the battery negative to the engine casing. In each of these connections the main failure points are the connections themselves, so while some of the terminals are soft copper, they do need to be tight. 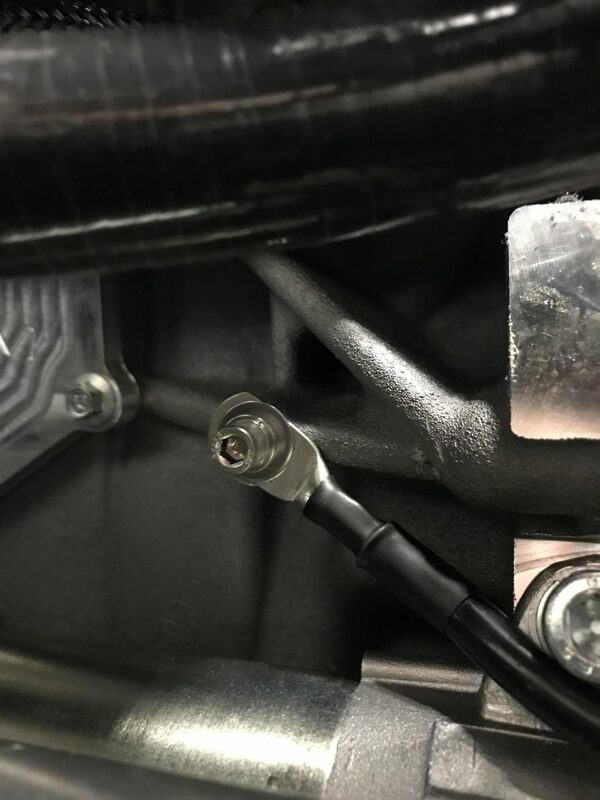 Not crazy tight… but the leads mustn’t be loose or else this will create a high resistance connection and the starter motor won’t get the current it needs and therefore won’t reliably start the car. Another simple job was to sort out the oil connection from the triangular aluminium oil tank to the oil catch bottle now mounted on the LHS chassis rail near the radiators. I’m not totally sure under what conditions this catch bottle comes into play. You’re supposed to connect this catch tank/bottle to the oil tank but also leave a hole in the bottle so it is open to the air. That means the oil system is running essentially at atmospheric pressure. So… I can’t see that there’s any pressure build up anywhere that would dump oil into this catch bottle. 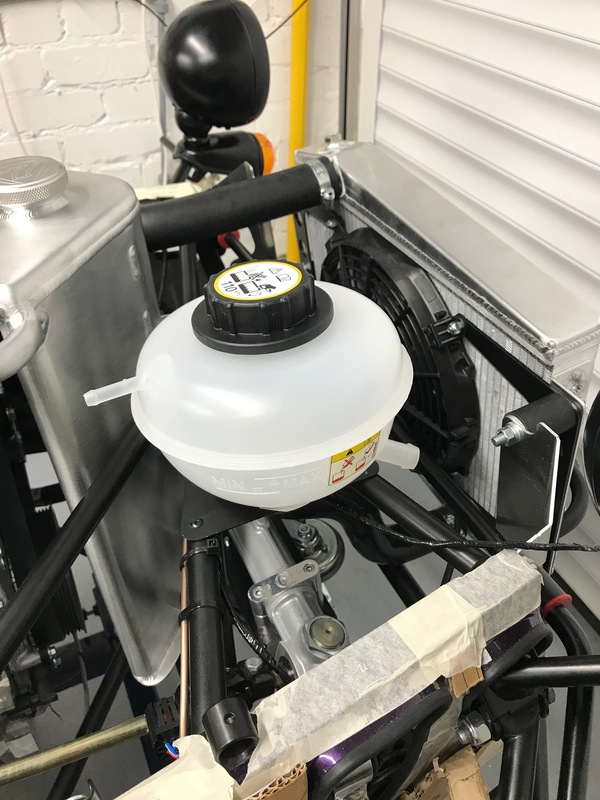 Now I get to think about it… My current theory (and I’m totally open to being shot down here)… is that to keep things simple, the dry sump oil system only needs to run at something around atmospheric pressure. It also needs room for oil to expand into as it gets hotter. If you have expansion with no change in pressure then the volume has to change. i.e. the oil expands a little into the volume of the oil tank. If the oil system was not open to the air then pressure would increase as the oil got hotter. 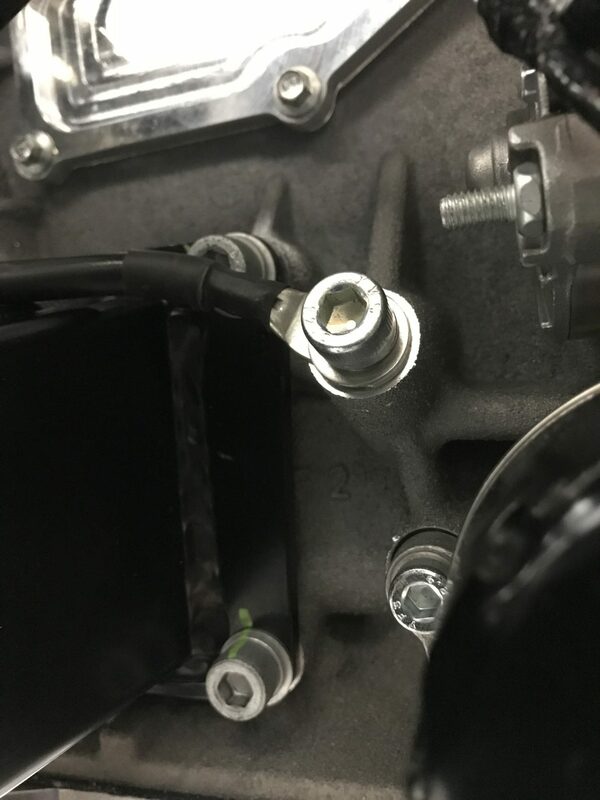 By putting a catch tank in you have a reservoir that’s removed from the main oil tank that is open to the air and means you don’t need any fancy pressure relief valves on the main oil tank. A consequence of this “open” system is that splashes of oil can reach the breather pipe at the top of the main oil tank and so you do end up with some oil ingress into the catch tank. We’ll see how much oil I actually get there and whether there is some scenario where oil is “forced” into the catch tank instead of just finding its way there. Anyway, enough of the theorising… To connect the oil tank to the catch bottle I used a straight piece of hose from the J-hose left over from the water installation (28mm OD) and then drilled a 25mm hole in the top of the catch bottle. I made sure the 28mm hose went down a long way into the catch bottle. A) to stop it from coming out (it’s not glued or fixed in any way) and B) to stop any splashing of the oil I’m not expecting to end up in there! 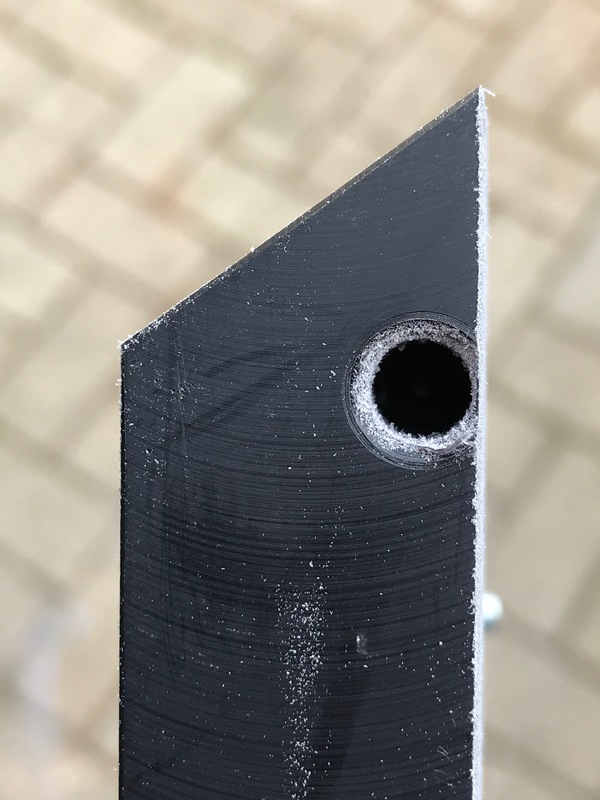 So, I connected the 28mm OD hose from the main oil tank to the catch bottle through the snug 25mm hole I’d cut with a wood spade drill bit. I then pulled off the hose that came with the catch bottle. This is about 500mm long and is a friction fit through the supplied centre cap on the bottle…. I’ll use this after the IVA test to duct fumes from the oil catch tank down under the car, but for the moment that would be an IVA fail… i.e. I think, if you have a pipe from the catch tank pointing at the road… then no matter how unlikely it is… there is a chance that oil could be dumped from the main oil tank, into the catch bottle and then out of the breather pipe and onto the road… very James Bond. I have heard people complain that having the catch bottle vent directly into the engine bay can cause oil fumes to get into the passenger compartment. So, venting those fumes under the car makes sense, but can’t be done until IVA is over. A note to non-regular readers: IVA stands for Individual Vehicle Approval and is an approximate 4 hour government test of a kit car (in this instance) to make sure it’s road-worthy before I can apply for it’s registration documents. One final practical point here… having taken the hose out of the catch bottle that it came with, I didn’t like the fact that there was such a big hole left in the top of the bottle (the cap is still there though). 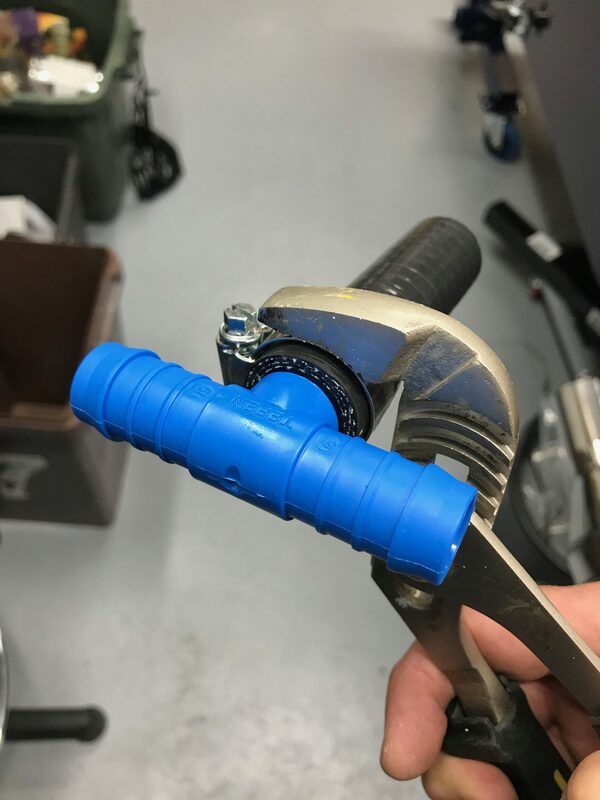 So, I took one of the “bungs” that was protecting the heater unit from getting crud in it during shipping and stuffed that into the hole in the oil catch bottle cap. I pierced the bung to keep the whole system at atmospheric pressure but it all just looked a lot neater that way. I’ve seen recent Caterham builds use a different cap on top of the bottle… with four small (~4mm??) holes in the cap. But… I couldn’t find a cap like that in my kit (with or without the holes) so I made do with the existing cap and the heater bung. I’ve probably mentioned this before but I was in a quandary as to what to do about a clear oil system failure at the bottom of the oil tank. Clearly oil was just going to gush out of the hole pictured below and I couldn’t see anything in the build manual about what to do about it, nor could I find anything to plug the hole. 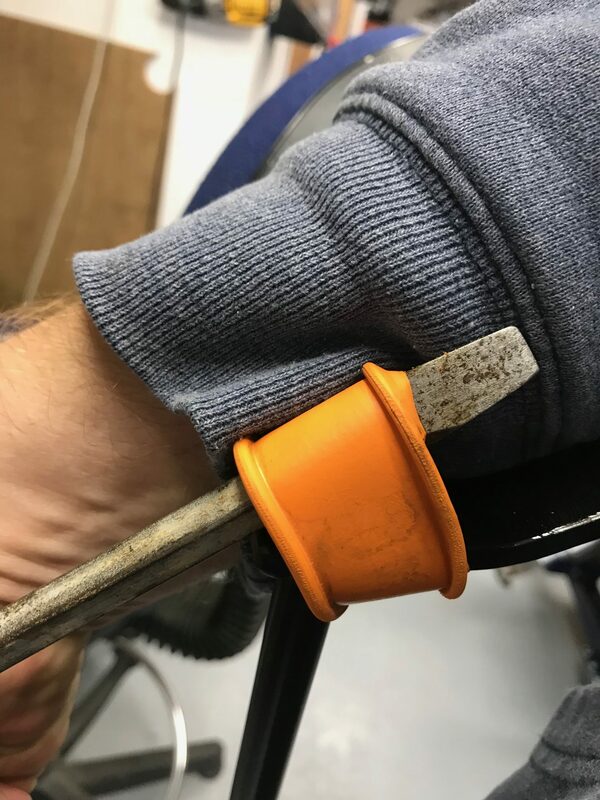 I’d read in the father and son blog that they had found a suitable bolt/set-screw and plugged the hole that way – with a copper washer no less. However, the thread seemed to be something other than a metric thread and I couldn’t find anything to fit from my collected junk (all essential, if my wife’s reading this!). A quick email to Derek Howlett and he told me that this hole is used on the racing cars to fit an oil temperature sensor and is connected to the loom (connections which I don’t seem to have). He said that they usually stick a dummy sensor in there to plug the hole for non-race car installs. Well that explains another conundrum… in one of the cardboard boxes there was a spare temperature sensor. I’d assumed this was accidentally included with my kit and was supposed to be used on the water circuit if I hadn’t already got a water sensor connected. Ahhh…. 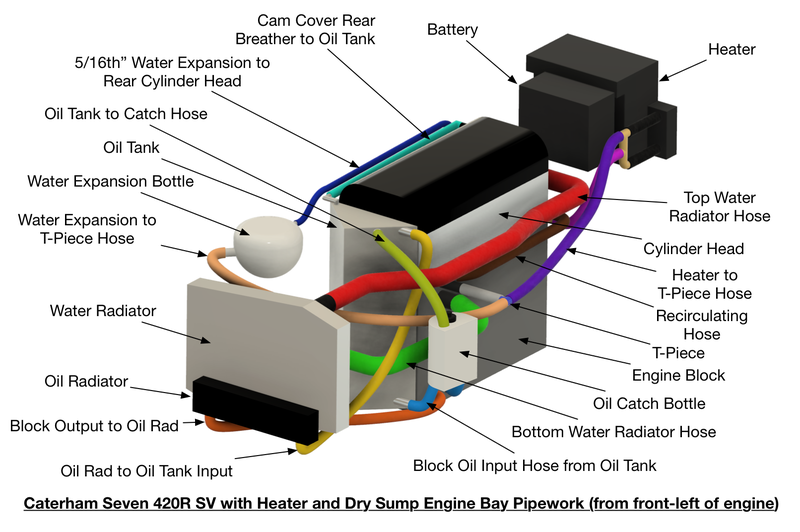 its the dummy sensor for the oil tank… I see. If I’d have thought about this some more then I would have also added some PTFE tape to the sensor threads just to make sure there was a good seal. I’d read somewhere that these sensors have a tapered threaded section and so don’t need the tape. Whatever… I was too eager and added the sensor in my haste to get a job done. By the time I remembered about using tape on the threads I had already added oil and there were no leaks from the sensor and so no harm done (for the moment). 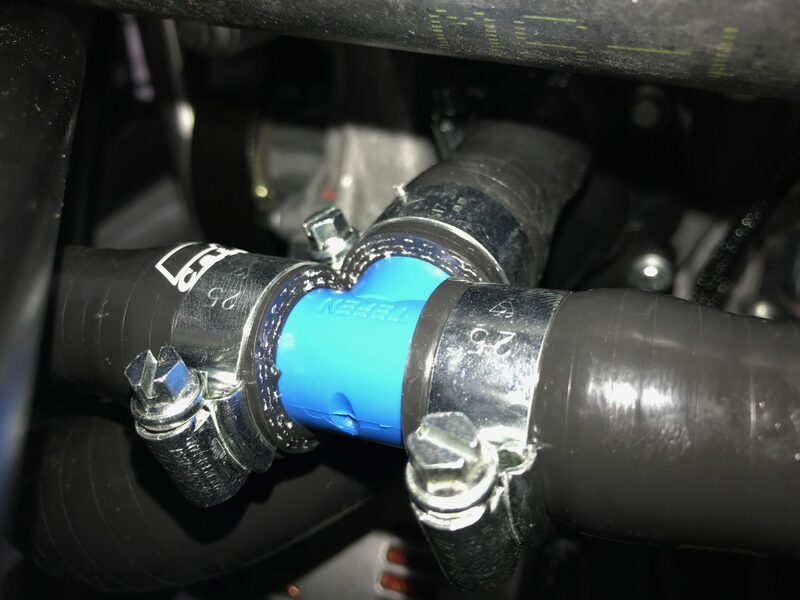 Ok, so if you remember, I’d routed the 5/16″ water expansion hose as per the manual – from the expansion bottle, round the LHS (cold) side of the engine and then back around the back of the engine into a connection on the rear RHS of the cylinder block. This route didn’t take up all of the 5/16 hose but nearly all of it. All the other builds I’d seen have taken this hose straight across the top of the primaries and cable tied it (if you’re lucky – on some builds I’ve seen it just dangles) to the rear cylinder head oil breather pipe. 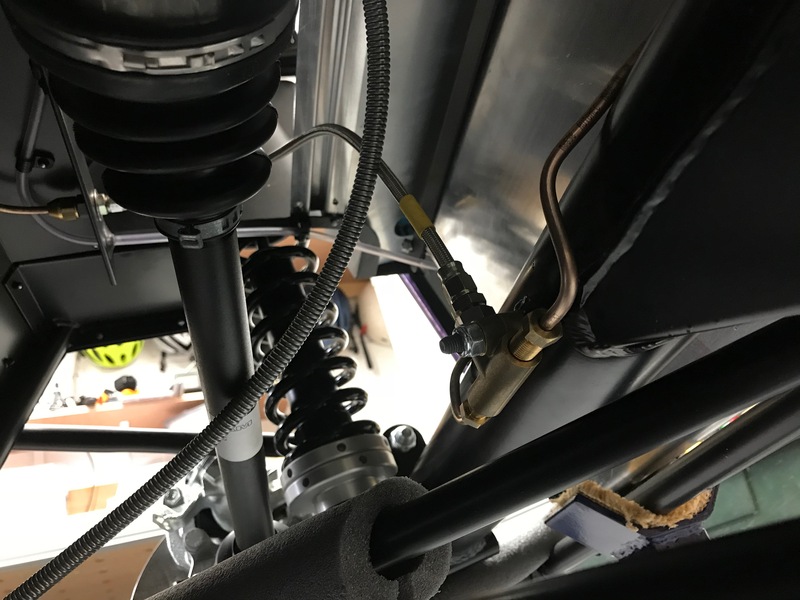 I’d decided at this point that I was going to need the spare pipe that could be liberated by routing the 5/16 hose over the primaries – the spare is used to shroud the braided clutch hose and the braided brake hose at the rear of the car. However, on the 5/16th pipe, I don’t just like using cable ties to lock things down. I know I’m going to have to do a lot of that later when I tidy up the engine bay, but it wrankles. So, I came up with a scheme to use two pairs of p-clips to attach the 5/16 hose to the oil breather pipe. It seemed to work out well, but we’ll see what happens at PBC and IVA – I’m a little nervous of this one. Using two pairs of P-clips to route the 5/16 water expansion hose next to the oil breather hose. The 5/16 hose is the hose going from the rear of the cylinder head to the round white water expansion bottle, with a black cap on it, on the right of the picture. This should have been a simple job… but… it wasn’t. I tried to do it late one night and clearly I wasn’t firing on all four cylinders. The handbrake cable is one long cable housed in a spiral metal sheath. 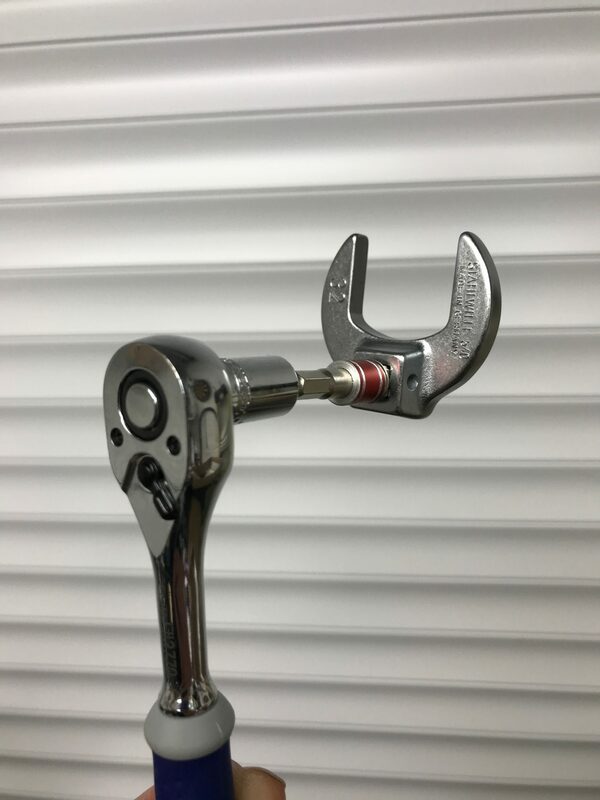 There are hooks at each end where the cable hooks onto the rear callipers and there’s a break in the sheath in the middle where the inner cable loops around a pulley attached to the handbrake lever. The handbrake operates by pulling on the inner cable and therefore operating the rear callipers. 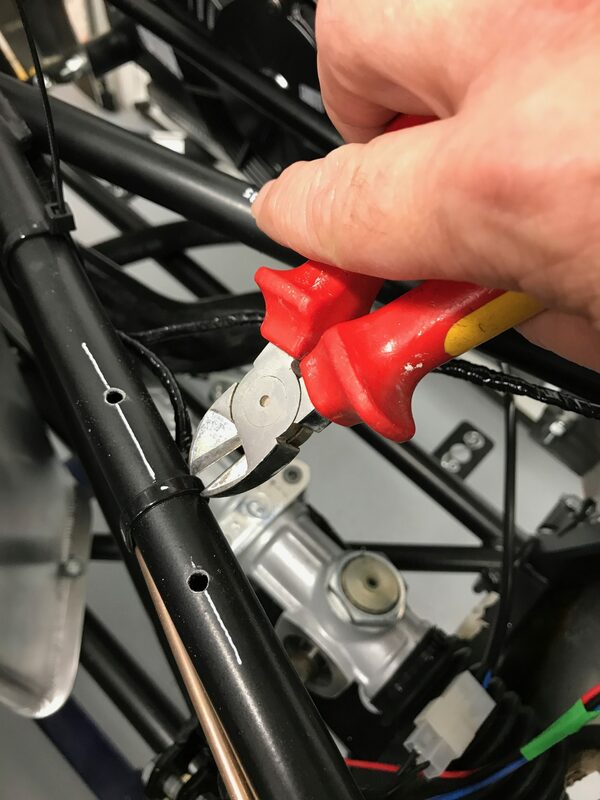 While the inner cable is pulled by the handbrake lever, the outer cable remains stationary and is what is fixed to the chassis of the car. 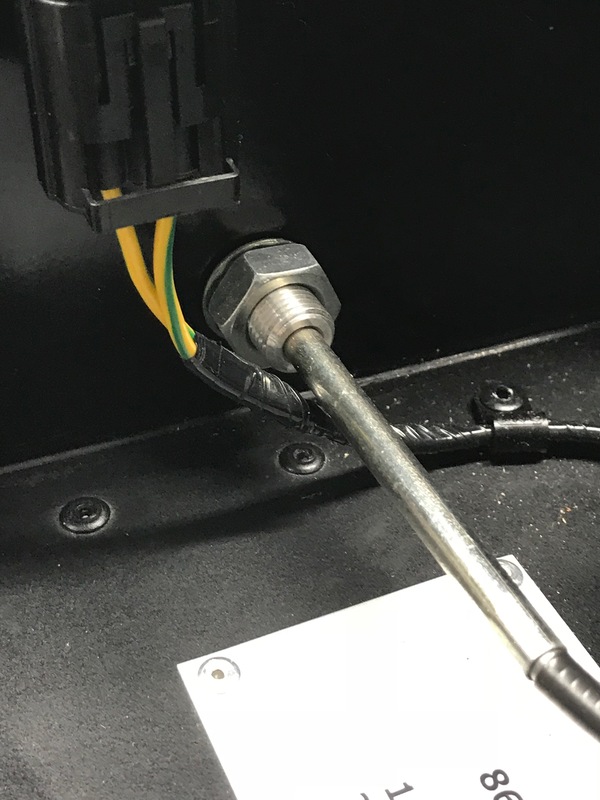 The outer cable is also there to protect the inner cable from abrasion – either from it rubbing as the suspension goes up and down, or from the handbrake being operated. I can also imagine that the outer sheath is there to protect a critical safety system (the brakes) from getting severed if a rock or debris, kicked up from the road, were to hit the cable. 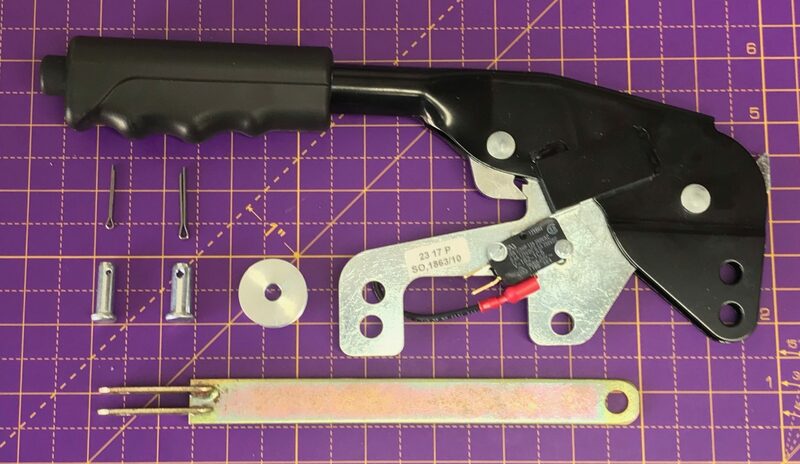 The connection from the handbrake lever to the cable is made with a clevis – which is essentially a u-shaped piece of metal (shaped like a tuning fork) and a wheel that can spin in the “u”. 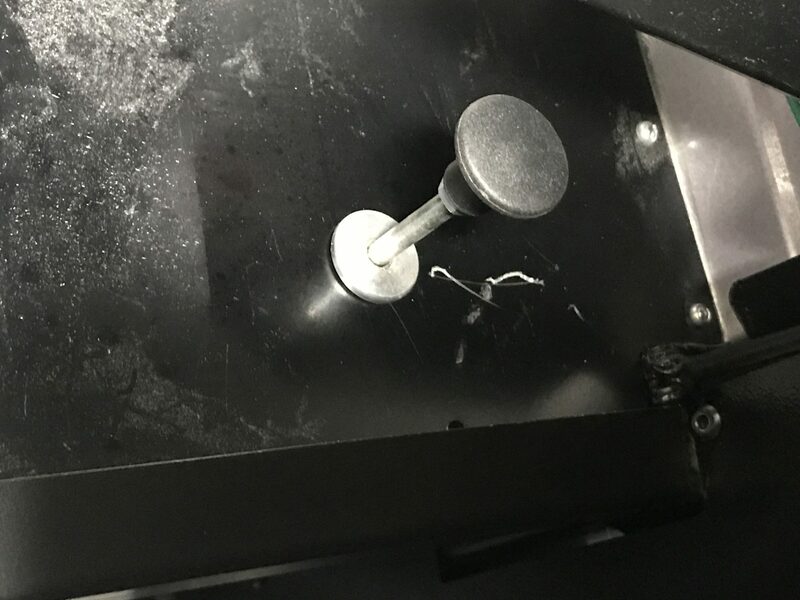 The wheel and handbrake lever are attached to the clevis with pins retaining pins and split turns holding them in place. By the way… the clevis and wheels etc were in my poly bag marked “axle pack”. However, I found the split pins in the miscellaneous poly bag. The bit that I got stuck on was where the outer part of the cable is retained in the chassis. On the LHS of the car there’s a yellow retaining plug that obviously sits in a clip in the transmission tunnel at the base of the rear firewall. There’s a similar clip location on the RHS of the transmission tunnel and I got it in my head that the handbrake adjustment screw should locate in there. There’s also a retaining clip on the diff but I couldn’t see how to feed the handbrake cable into it. After a lot of pushing and shoving sort of got the RHS handbrake adjuster into the clip at the base of the firewall… but it didn’t seem right. Need to rethink…. hmmm. So, one of the downsides of trying to fill the diff with fluid after installing the diff is that there’s not a great deal of room behind the diff – between the diff and the fuel tank. My 14mm Allen keysocket wouldn’t fit in behind Diff with ratchet on it. The allen key set I had bought from Amazon some months ago had quite long shafts on them and the combined length of the allen key and socket wrench was about 106mm. It wouldn’t even fit into the hex bolt on the back of the diff. I could grind the 14mm allen key down in length but I’d rather have kept it intact. I asked two neighbours including Pete, the Lotus guy…. neither had anything bigger than 12mm. So, another trip to Halfords… Which was fruitless…! Halfords had some expensive socket sets that looked like they had a shortish 14mm allen key but I had one already that would be a lot cheaper just to modify. I also thought I’d pick up some spare Diff fluid while I was there along with some hose and a funnel to fill the Diff with. I failed… no allen key, hose and diff fluid but I did find some cheap funnels at B&Q. So, nothing for it but to cut off the end of the 14mm I already had. I started with a “re” (reciprocating) saw but finished with a metal cutting disc on a Dremel. I cut about 16mm off the end of the key I had. On my car there is ~105mm between the front of the petrol tank and the rear of the diff casing. 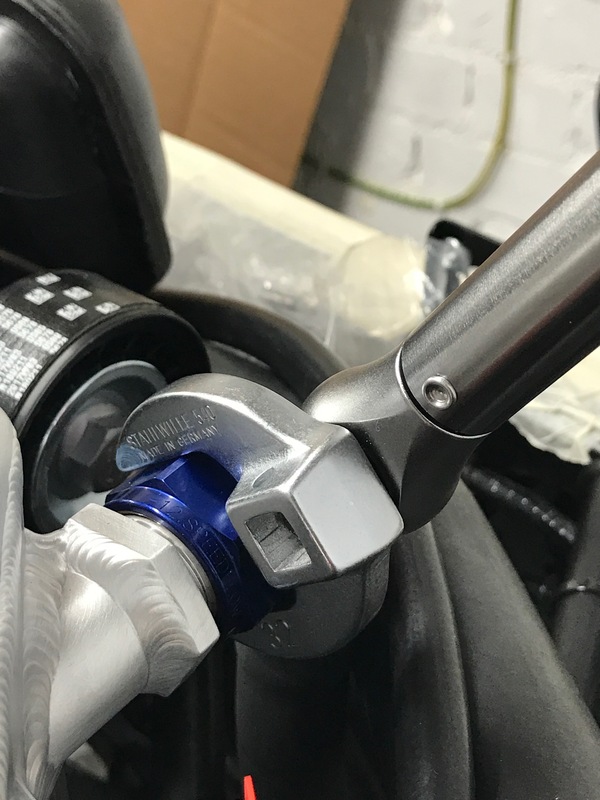 Allowing for the 12mm depth of the diff drain plug you need your Allen key to be sticking out of the drain plug by no more than around 90mm – including any socket ratchet etc. I tried to find some plastic piping while I was out at Halfords – even went into B&Q. I found some cheap funnels that were cleaner and less unwieldy than the one I had but no tubing. So, when I got home I decided I’d use the spare length of 5/16th fuel line hose that Derek had sent me for the water expansion bottle – this spare length of hose came about from routing the water expansion bottle over the hot side of the engine instead of around the cold side (see above). The two future uses I had for this spare tube were not going to be taking fluids and I guessed that whatever “synthetic differential fluid” is made of it wouldn’t be a problem to fuel hose. I set up the funnel and tube and started to poor. The funnel I chose was a little small but it fitted into the hose better than the larger ones so I had to spend more time filling but it probably wasn’t much slower. The manual talks about filling the diff with 1.1L of oil. I presume that if the last 100ml was a problem then Caterham would have actually supplied 1.1L instead of the 1L container. I’ll try and remember to confirm that with Derek when I next find a reason to email him. After the diff had taken the whole 1L I left it for half and hour or so for all the dregs of the fluid to run down the hose. It’s better to be in the diff than washed out and wasted. 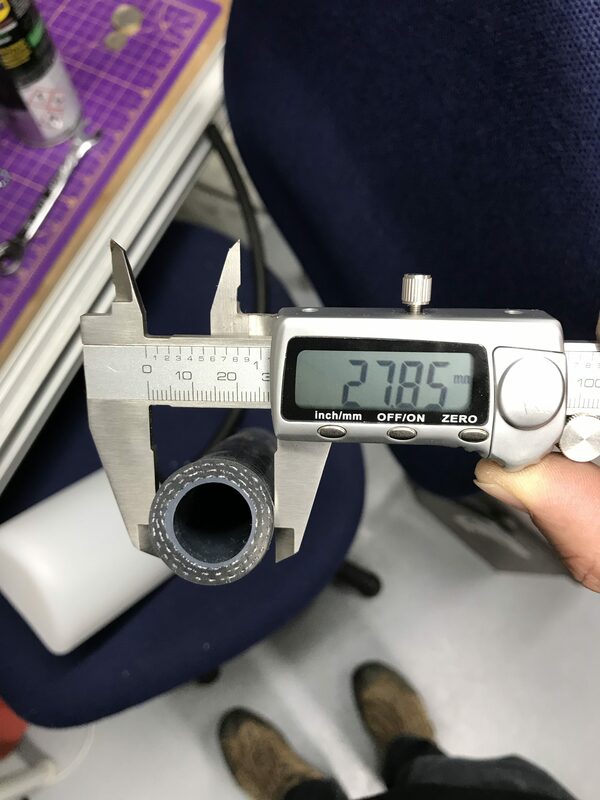 A “little-finger” test (that’s using my little finger to test the fluid level and not meant to imply that the test was little) seemed to show the fluid level to be a few millimetres below the plug hole…. that’ll do for the moment. According to the container, the fluid contains olefin sulfide and alkyl amine. The bottle warns that this can produce an allergic reaction. I had no problem with it on my skin, though I was carful not to get too much splashed around. However, filling the diff sent up a very strong smell of rotten eggs, given off from the sulphur content and it made me nauseous. I’m not sure its creating hydrogen sulphide, but it does smell like it. When I was done I washed the fuel hose out with some universal solvent (a.k.a petrol) which seemed to do the trick at flushing the hose. Ok. so today was not going to plan. What with the handbrake cable and now the propshaft bolts… things weren’t going as smoothly as I’d planned. 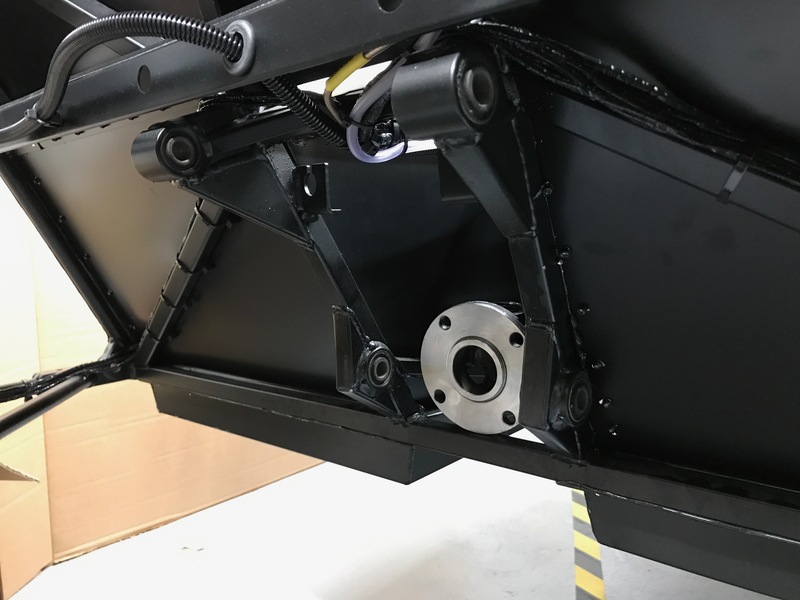 The propshaft bolts simply bolt through a flange on the back of the prop-shaft and into threaded holes on the front of the differential. You use some loctite to make sure they don’t come out. However, as you turn these bolts, so does the propshaft. I tried putting the car into gear but the gearbox just didn’t seem to want to engage a gear. The only gear that went in was 5th and that jumped out as soon as I turned the prop. I’ll have to take a look at that at another time too. 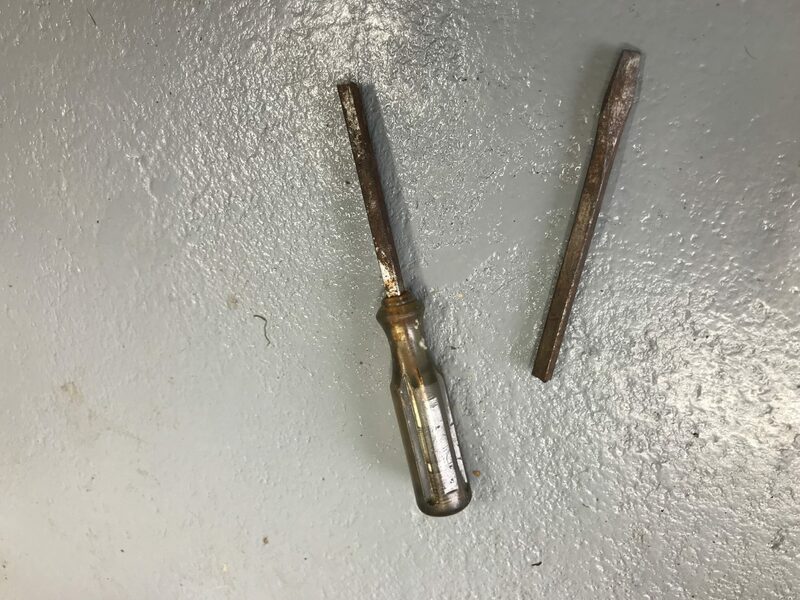 I also tried jamming a screwdriver into the universal joint at the rear of the prop-shaft and tightening the bolt up against an opposite force on the screwdriver. But the screwdriver kept slipping… and… then… … … it jammed. I was using the mankiest (that’s a good british word), crappiest, big screwdriver I had. 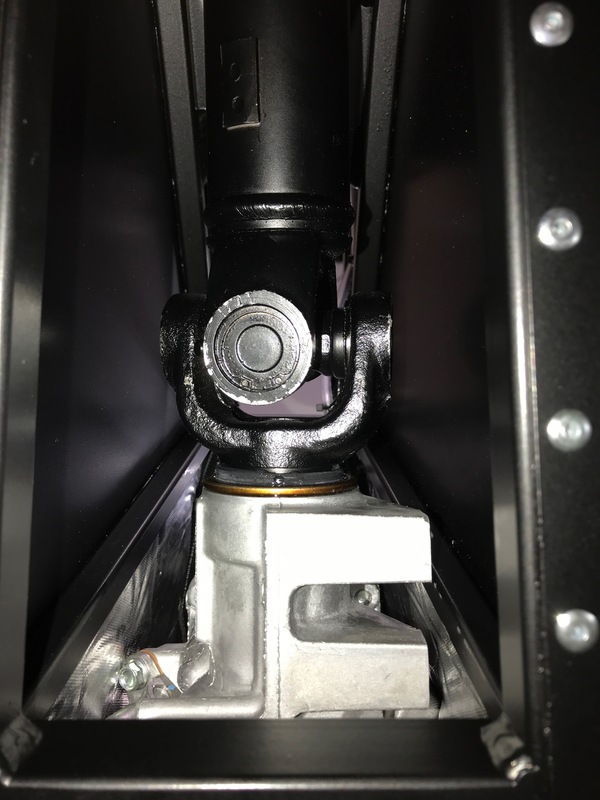 It has a square shaft that’s great for getting a spanner on when a screw won’t shift, but in this instance the square section resolutely jammed itself between a chassis rail and the inner workings of the universal joint. 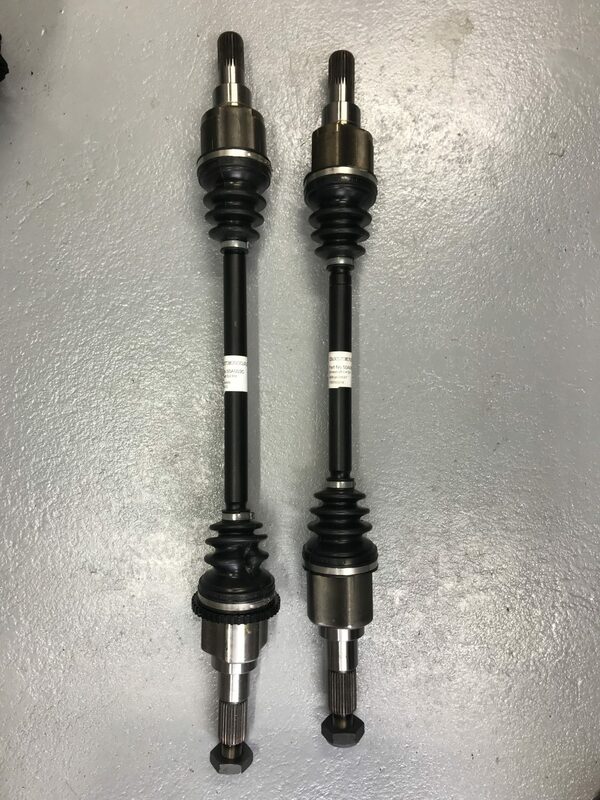 I tried all sorts of to-ing and fro-ing of the screwdriver and propshaft. But to no avail. The screwdriver wasn’t coming out. After a cup of tea and a think… there was nothing for it. I was going to have to cut the screwdriver out. Out with the dremel and 5 minutes later I had a much shorter screwdriver. Ok, that’s enough of that… I submit… I’ll take a look at the propshaft bolts another day. 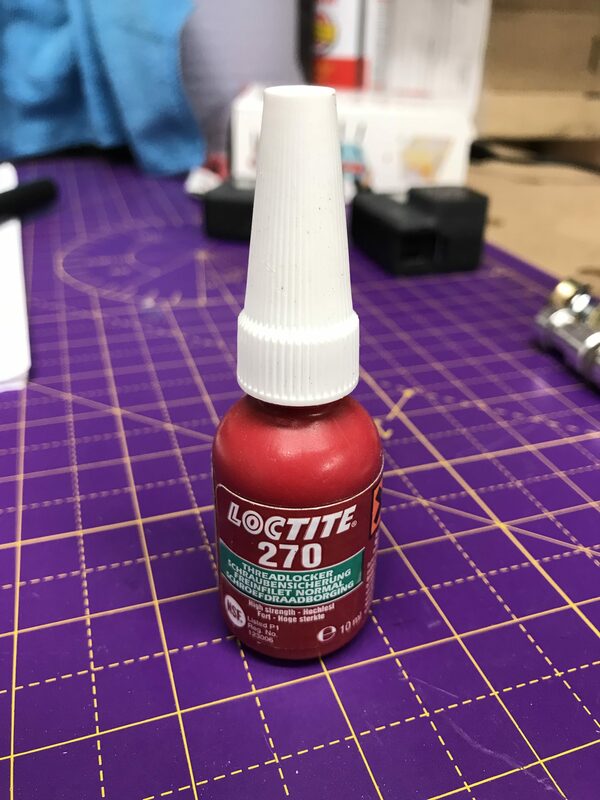 By the way, if I can get to the point where I actually have the bolts installed, I’m using Loctite 270, high strength, for the propshaft. Can’t be too careful about the propshaft bolts coming out! Next up is fitting the drive shafts. Simple job. They are handed and drop straight into the diff once the red plastic stoppers have been removed from the diff. They didn’t seem to go fully home but I’ll take a look at that in the morning. That wasn’t quite the end of a relatively long day, but I’ll cover the De Dion tube in one go in the next post. Some success, some failure. More of the former tomorrow I hope. Ok, so this post is a bit of a cheat. 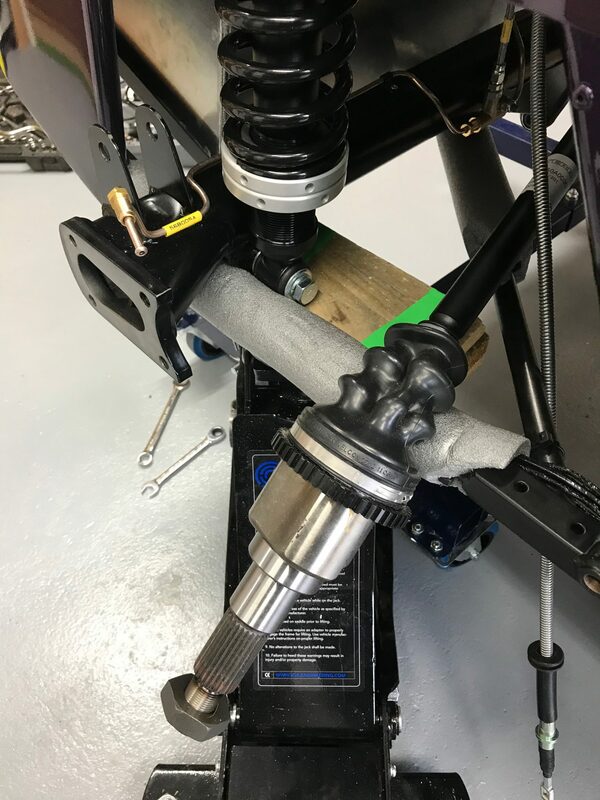 I actually put the prop-shaft and differential into the car yesterday… but it seemed to make sense to lump all these activities together in a single post. Before we get to that though, and just to get me going today, I decided to have a look at the accelerator cable tension. There are many posts and discussions about this being too long and the need to bend the accelerator pedal shaft to take up the slack. It’s a trivial job, take out the cable from the accelerator pedal upper shaft and bend the shaft. I used the approach talked about in the build manual: find a suitable philips or pozi screwdriver and insert it in the upper shaft. Then brace the lower half of the pedal against the rear pedal stop (I cut a length of wood to the right size) and bend the shaft. Most of the movement seemed to be at the joint of the upper shaft with the rest of the assembly – but that seemed ok. It was a case of bend a bit, test the cable tension, bend a bit more, test the tension etc. I expect to have to tweak this some more once the engine is running and I can set the throttle stop position. 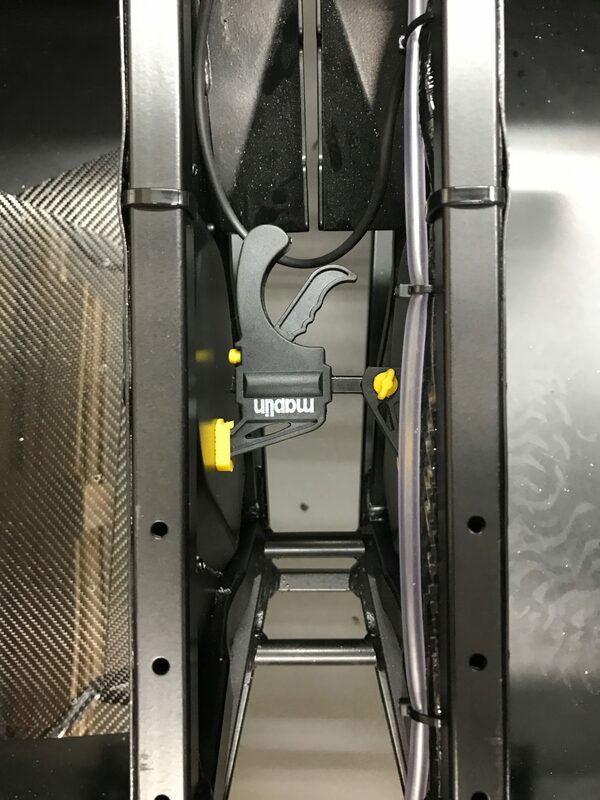 A quick test fit of the pedals by sitting in the car seems to show that the accelerator pedal is too far off to the right in the pedal box. I won’t be able to heel-and-toe with this setup. That’ll be another tweak after IVA, but this time to the lower accelerator pedal shaft. Throttle cable tensioned. The brake and clutch pedal assemblies are at the top of the picture and the accelerator pedal at the bottom. You can see the accelerator pedal on an SV is off to the RHS of the car in comparison to the clutch and brake pedals. As far as I could tell, installing the prop-shaft should have been a quick and easy task. While easy, it turned out not to be quick. On first offering up the prop to the transmission tunnel from the back of the car (it has to be fed in from the rear of the car, so no chance of doing this once the diff is in place) it became apparent that it wasn’t going to go in without a fight. The universal joint at the gearbox end of the shaft was catching on the side panels of the transmission tunnel. The prop has standard universal joint setups at both ends that have two U’s holding an inner cross. 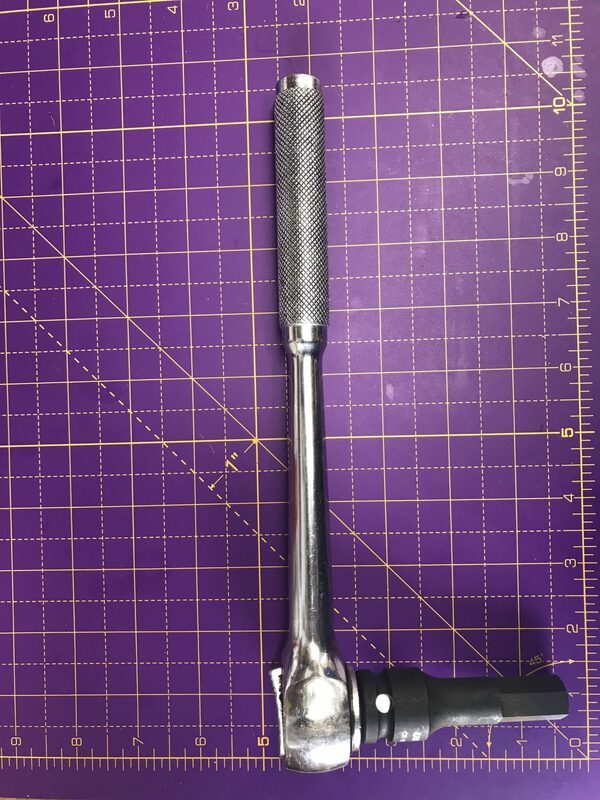 The U’s are a larger diameter than the shaft itself and the joint on the gearbox end of the assembly just would not go down the transmission tunnel, no matter how I rotated the shaft. Rotating helps because the universal joint has a square cross section and as you rotate the shaft there is a minimum width it achieves – when the cross is at 45 degrees to the horizontal/vertical. Even with this jiggling, it caught on the the transmission tunnel side panels, just behind where the handbrake sits. At this point there are recesses pressed into the panels that encroach into the tunnel. I can’t see that these recesses do anything to add extra passenger room, maybe on a narrower S3 chassis they give a little more space around your hips if you have the tillet seats… but that’s a wild guess. Maybe they’re there to stop the side panels from vibrating??? I did wonder if the prop shaft needs to be fed into the tunnel by first feeding the differential end in from half way along the tunnel. The idea being to feed it in just behind the hand brake, backwards towards the rear of the car. Then once its lift up into place, bring it forwards again into the gearbox. But that clearly doesn’t work as the plate on the differential end is much too large to go down the tunnel as well. The only way I could see to get the prop shaft in was as I first thought… feed it in from the rear of the car down the whole length of the transmission tunnel. Attempting to spread the transmission tunnel panels with a Maplin clamp. Side panels have recesses that stopped the prop shaft going down the tunnel. So, there was nothing for it but to use some persuasion. 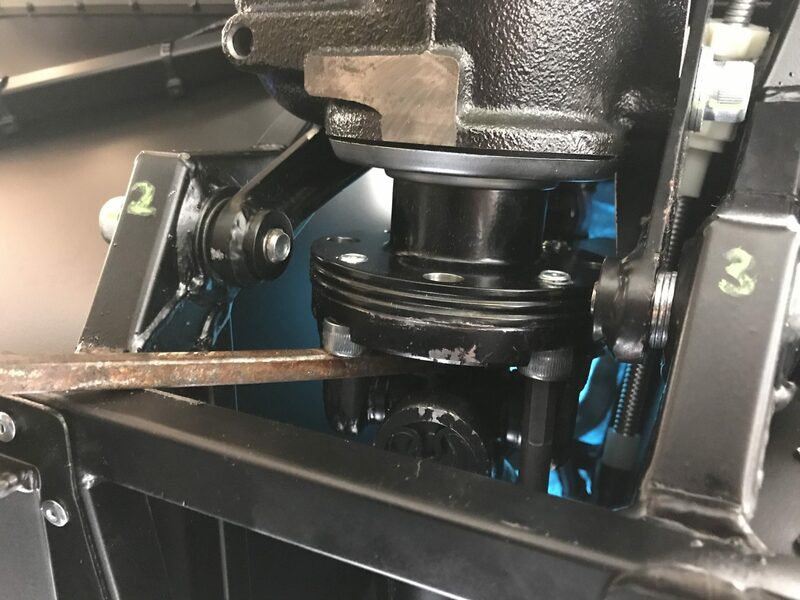 I mounted the prop shaft as far down the tunnel as it would go, then a few hefty clouts with a rubber mallet and the prop shaft moved past blockage and was then easily fed into the rear of the gearbox. It scratched the sides of the transmission tunnel on the way through but nothing cosmetic there so I didn’t worry about fixing the scratches. Prop shaft finally fed into the gearbox (bottom). You can see one of the U shapes making up the universal joint and how it’s wider than the prop shaft (top). It was late in the day on Saturday now but I wanted to at least get the diff hung on its top chassis mounts. The two top and two bottom mounting points. The back of the Prop shaft is sat on the chassis rail. You can also see the corrugated fuel pipe running through a grommet at the top of the picture. For this job I was going to need another pair of hands, its definitely not a one person job the way I did it. I can imagine you could do it by yourself if you had an engine hoist lifting the diff through the hole in the boot and with the wooden floor removed. But… you would need to create some sort of cradle for the diff to sit in so it’s vaguely sitting level. So, I enlisted Joe’s help and we got to work. 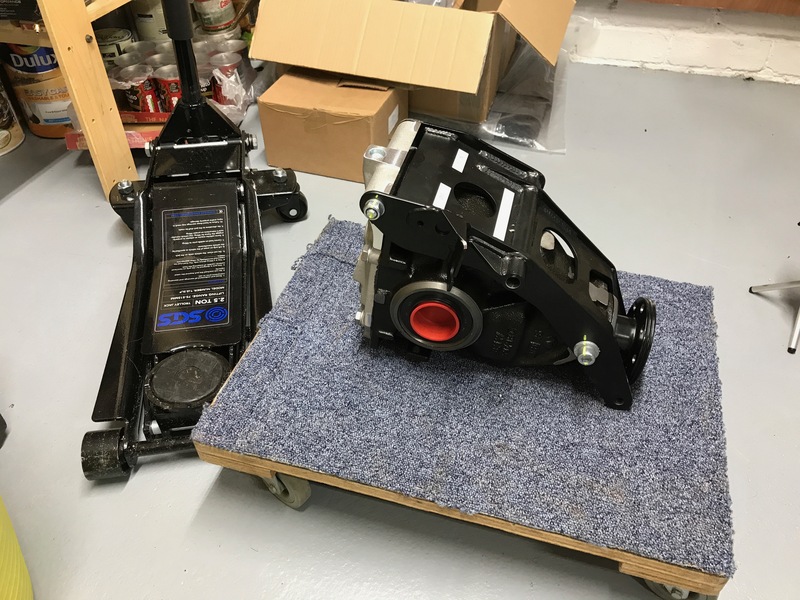 I had already measured the distance from the floor to the top diff chassis mounting points and worked out that our trolley jack wasn’t going to be tall enough to lift the diff into position. The trolley jack lifts up to 504mm but it was a couple of cm short of being tall enough. You also have to remember that these jacks start to operated almost horizontally (pulling the car sideways) at the top of their travel. I could have lowered my axel stands one or two notches to help here but I decided I wanted as much space as possible to work under the car. If I was doing this again I probably would just temporarily drop the car down so I didn’t have to worry about the blocks of wood balanced on the jack. 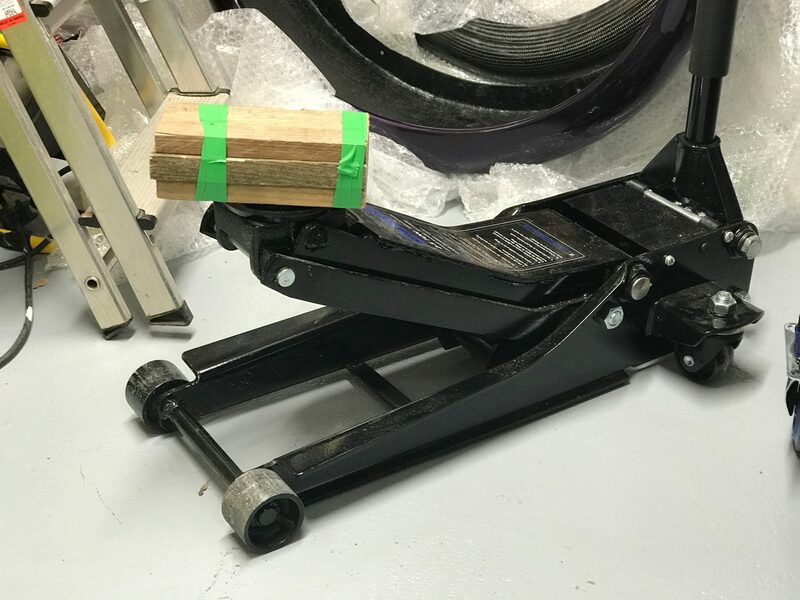 Some people have placed the jack on some wood but I wanted the jack to be as mobile as possible while we manoeuvred the diff into place and I hadn’t got enough large sheets of ply-wood to hand that could raise the diff but keep the manoeuvrability. Our solution was to put three pieces of wood, taped together, on top the jack. Trolley extension piece :-). Gets used lots in the future. With Joe operating the jack and me under the car, keeping the diff balanced on the wood (and the jack), Joe could put a large screwdriver through the top bushes and diff. We got there in about 15 minutes. The diff on top of the jack was pretty precarious but I didn’t have any big fear of it falling, its heavy, but not that heavy, it just needed patience. Big screwdriver (top right) used to secure diff in its top mountings. This will be the last useful job this screwdriver performs… read on for its finale! What was this? It’s made from a fibrous plastic with two screws (top) and two bolts that screw into threads in the plastic (bottom). And then finally I had an epiphany in the early hours… and realised the mystery object was a blanking/skid plate to cover the hole. Ah-ha! That was going to be the first job in the morning! It’s, Sunday, another day but not another session. For the most part I’ve had one session per day, but I realise that’s making for a lot of posts. I thought today that I’d stick today’s session in with yesterday’s. It’s only a half day today so that should be ok. But back to the skid plate. It all made perfect sense now. 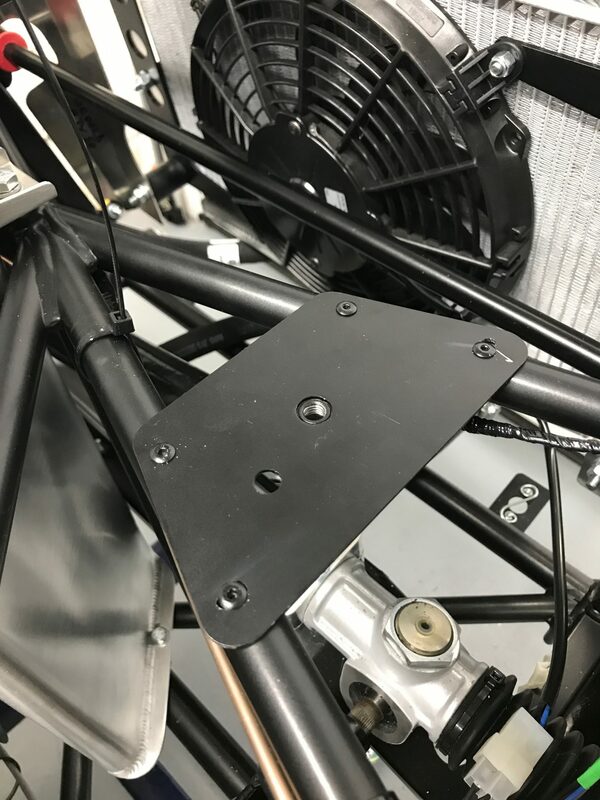 This blanking/skid plate was obviously made to fill the height difference, and hole, between the sump and bell housing. I just hadn’t heard of this in any blogs, or forum threads, so didn’t put two and two together – boy am I slow! When I tried to put this mystery object to work, it didn’t fit. If you look carefully at the picture of the bell housing above (with the geared cog showing through the gap), you can see that the holes on the left and the right of the bell housing have slightly different amounts of the hole showing. There is less of a full circle showing of the right side hole in the picture (which is on the LHS of the car with this picture taken looking backwards). There wasn’t enough of this hole showing. 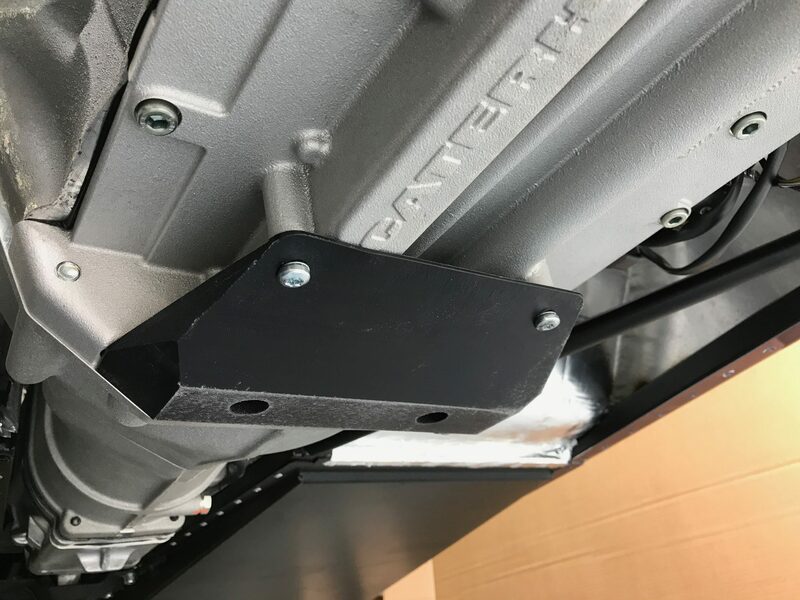 The skid plate is attached with two bolts that go forwards through the bell housing and into threaded holes in the skid plate. With this right hand hole the bolt would go through the bell housing but wouldn’t pick up on its thread in the skid plate. And no matter how hard I pushed and wiggled the bolt it wouldn’t catch the thread…. bummer! I now thought it might be possible that when I’d attached the engine to the bell housing, that I might have got the two slightly miss-aligned – i.e. the bell-housing and the engine rotated around their long axis relative to each other. This only needed to be less than a mm to not give me enough clearance for this hole. Hmmm. I really, really, really, didn’t fancy undoing the engine to bell housing bolts. If I’d have known this before putting the engine into the car then I’d have fitted the skid plate then and all would have been good. I could have fitted this plate while the bell-housing and gearbox were loosely attached and made sure there was enough room to get it tightened up. It just didn’t occur to me that this widget went where it does. So… did I mention that I really didn’t want to undo the engine to bell housing bolts now? Well I didn’t. As I write this a few weeks later (yes I am that far behind with these blogs) I would perhaps feel more confident about doing this but at the time I wasn’t keen. So, what to do? I did what anyone would have done. I made-do. I decided that if I shaved some material off the top of the skid plate then the plate would sit higher and the bolt would catch the thread. I clearly didn’t want to play around with the holes in the bell housing and it seemed that the least expensive thing to replace was the skid plate if I screwed it up. Material trimmed from skid plate slightly exposing the thread in the hole. It seems to me (ISTM) that this widget performs a couple of tasks. Number 1, it stops crap from getting into the bell housing – that’s gotta be a good idea. 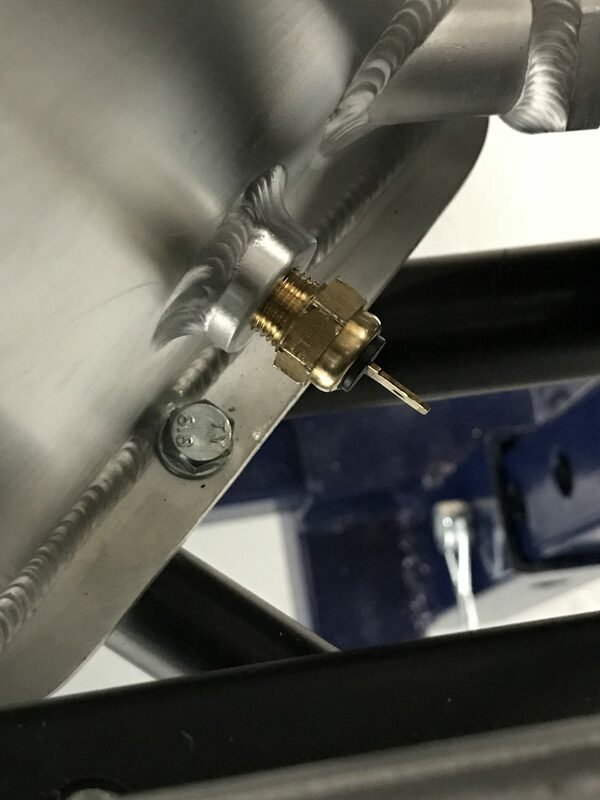 Number 2, it protects the bell housing from getting bashed when going over speed bumps and the like – its the lowest part of the car and is gonna get bashed… another good idea. 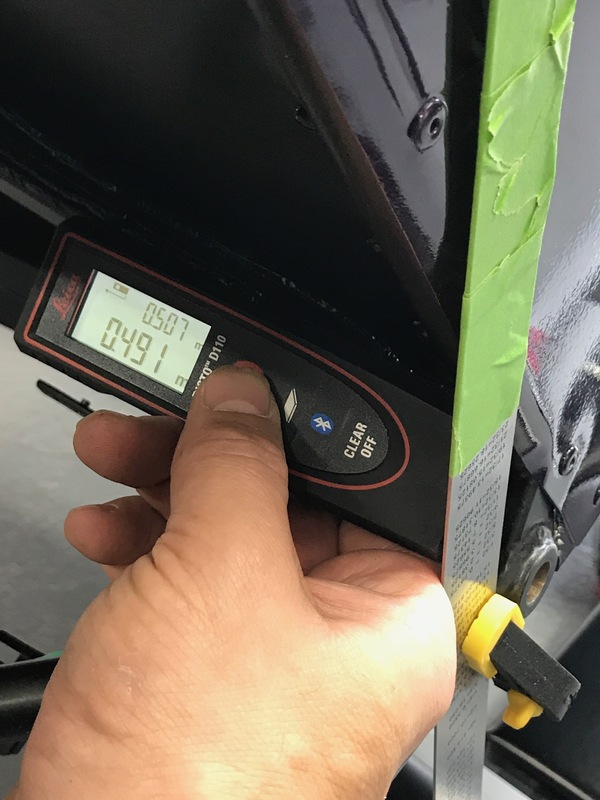 With the car currently sitting on axel stands… the skid plate is 10mm lower than the lowered floors (the next lowest point on the car). 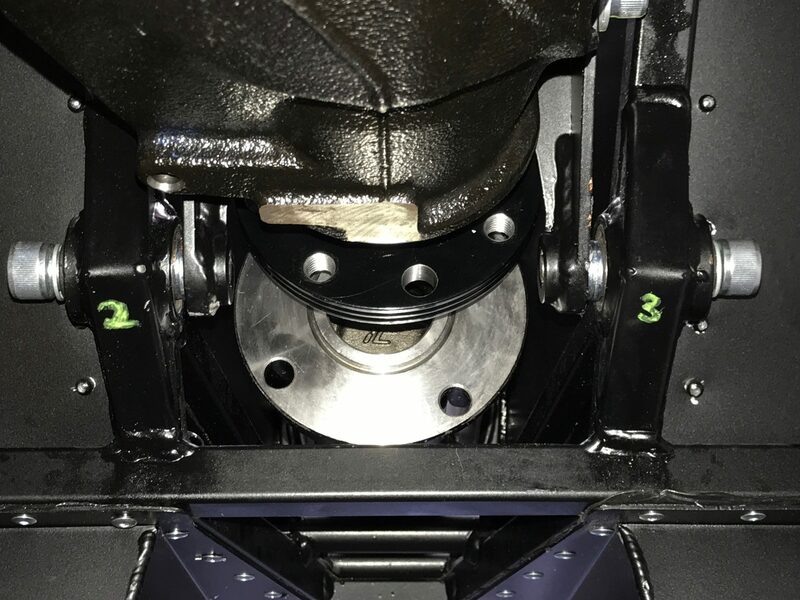 However, the bolts protruding from the seat-rail fixings that go through the floor and poke out into this air under the car, would probably also be about the same height off the ground as the skid plate. 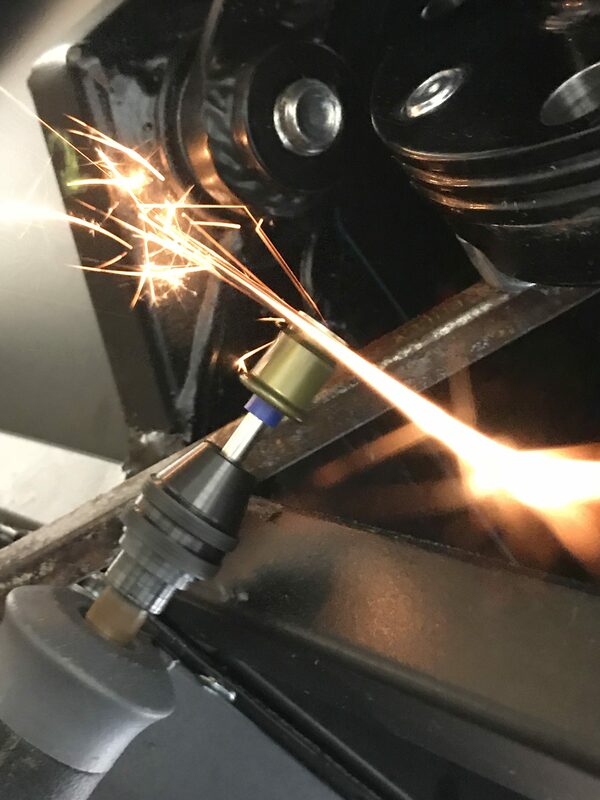 I’ve also heard people talk about how those seat bolts create sparks out of the back of the car when the car bottoms out in dips in the road. Hmmm. 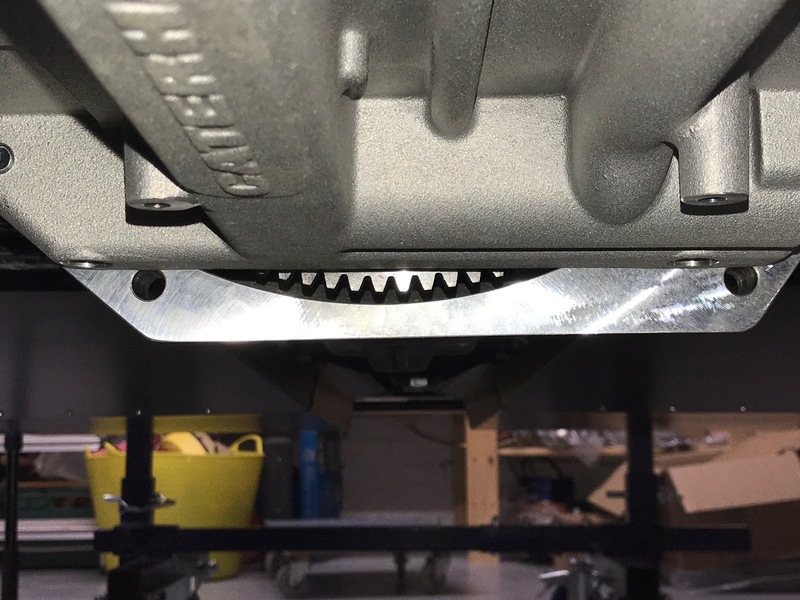 This skid plate was meant to be a 5 minute job. But in the end turned into more like an hour. Trying to fit the plate, deciding to modify it, attempting to file the material off the plate, realising that that was going to take forever because the material used is actually designed to put up with something like a file scratching against it (obviously – duh! 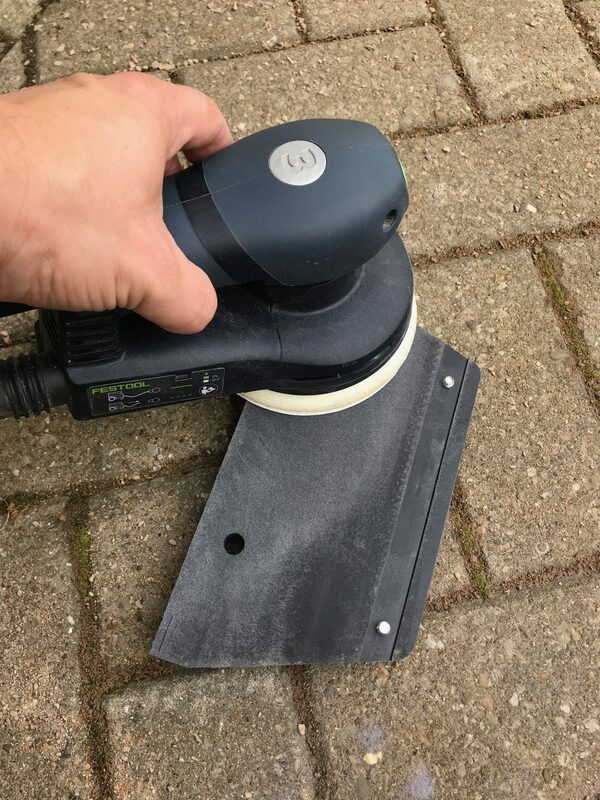 ), getting out the orbital sander, trial fitting a few times… an hour in the end. On with the rest of the day. I’d left you with a diff-hanger from the night before and so today was going to start with getting the diff centred and all bolted in. 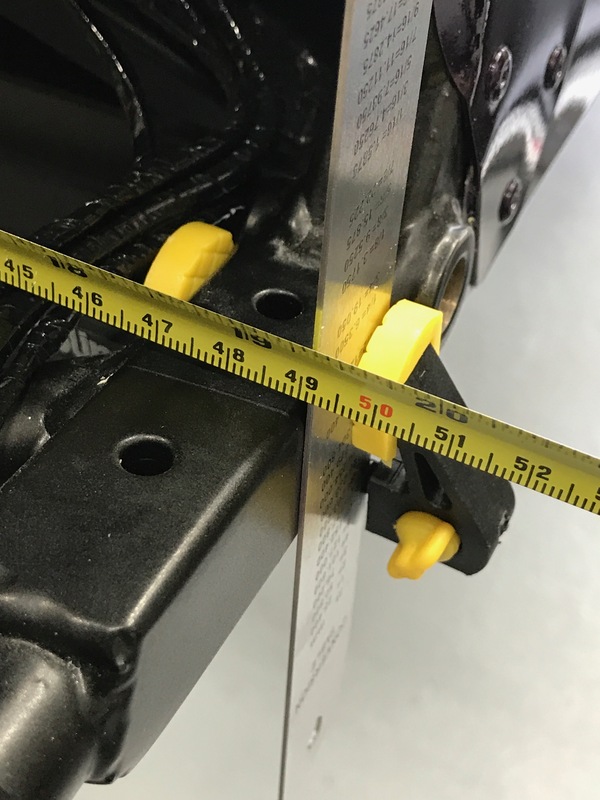 The build manual talks about centring the diff by measuring the distance from either side of the diff carrier to the respective outside edges of the square chassis rail section where the rear ARB mounts. That sounded complicated in the manual too… but its obvious really when you get to look at it in person. I don’t usually need an excuse, but I thought I’d pull out a gadget here… and decided to use a laser measurer. 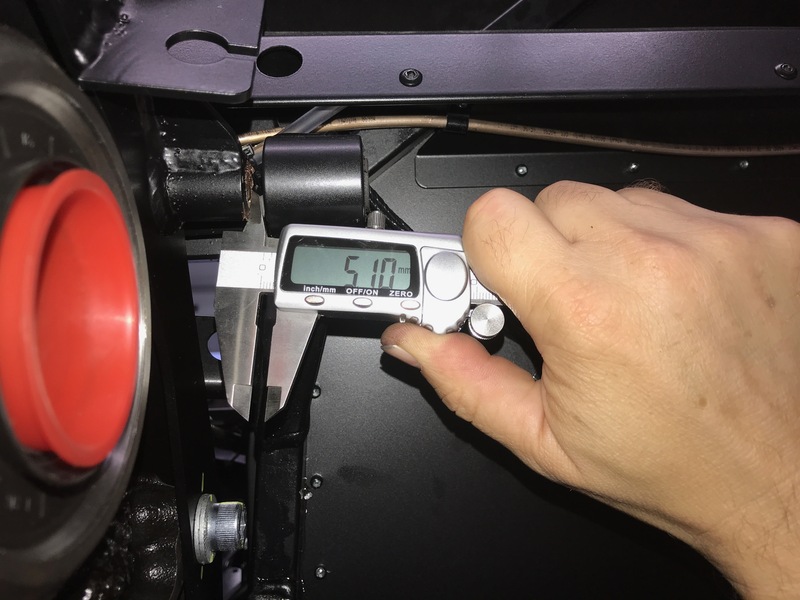 I set up a couple of steel rules and clamps, as reference points, and then used a laser measurer to get an accurate reading to the diff carrier (the BMW supplied Limited Slip Diff (LSD) has a Caterham specific carrier fitted to allow it fitted into a standard chassis without modifying the chassis or the LSD). The idea here is to centre the diff using washers as spacers in between the diff carrier mounting points and the chassis mounting bushes. My way to do this was to use the laser measurer to get a measurement the same on both sides but with no washers installed. Once the diff was centred I then measured the gaps between the diff and the respective mounting points using callipers. I then worked out how many washers I needed on each side to fill the gaps. (For those of you that are not in the UK… Stanley is a popular make of tape-measure over here). Now… remember we have a screwdriver in the top mounts and so we’re only worrying about the lower mounting points at the moment. 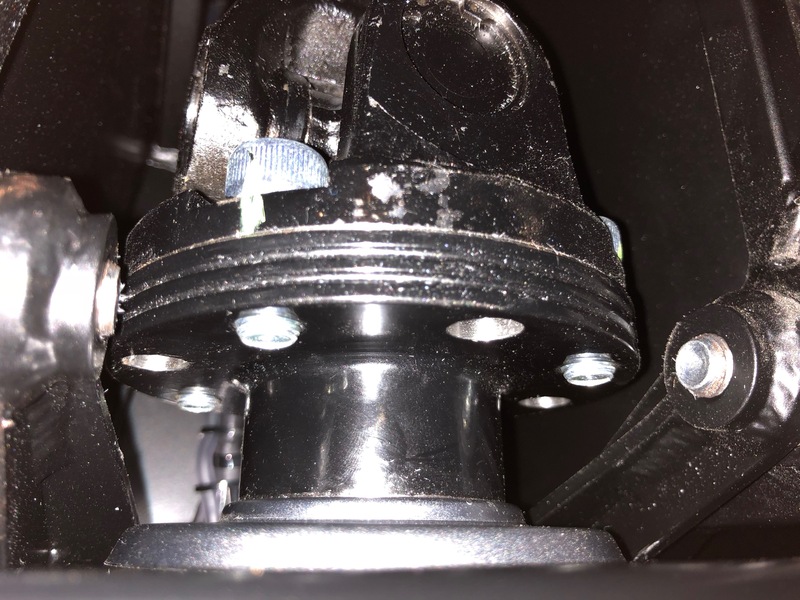 The next problem was that with the screwdriver only roughly locating the top mountings, these lower diff mounting points didn’t line up with the holes in the diff carrier. One side was ok but the other was a couple of mm out. 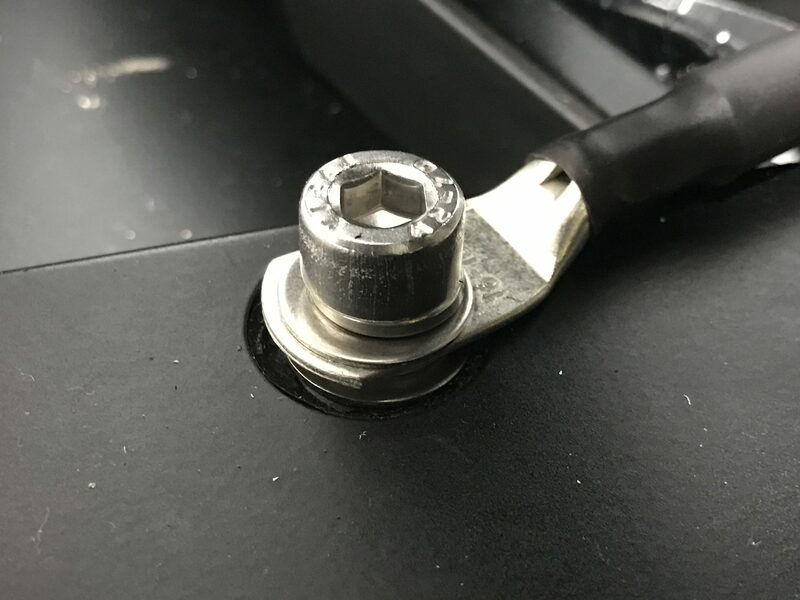 So, I put the bolt into the mount that did line up and then I broke out the trolley jack again and set it under other carrier mount point and jacked it into position. That was the two lower mounts done. I ended up with two washers on the LHS mount and three on the RHS. … and worked out we needed 1 washer on the LHS and 3 on the RHS. It struck me at this point that I might need to worry about the diff being twisted. If I’d ended up with these washer calculations the other way around… i.e. if the 3 washers were needed on the LHS top then I might have got the diff in slightly twisted… but with 3 washers on both the top and bottom RHS I was satisfied that this was unlikely. 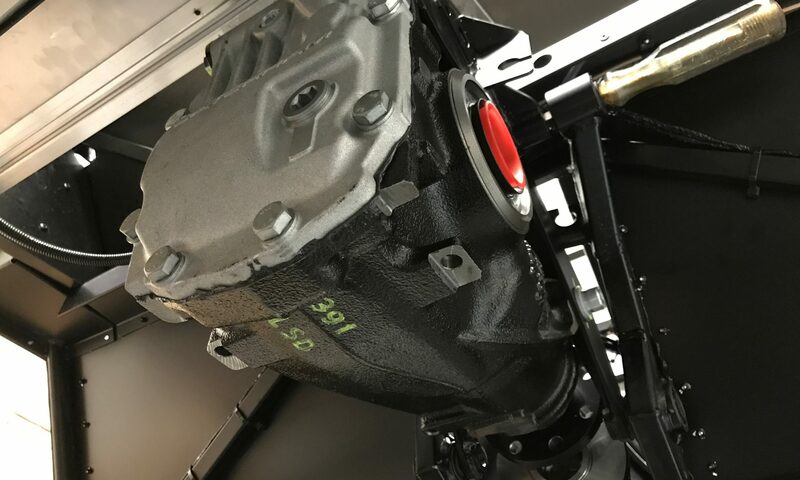 The top of the diff is held in with a single 11″ bolt that goes all the way through both sides of the diff and its mounting bushes. I ended up using this bolt to displace the screwdriver holding the diff in place and to bash in the bolt and push the screwdriver out. 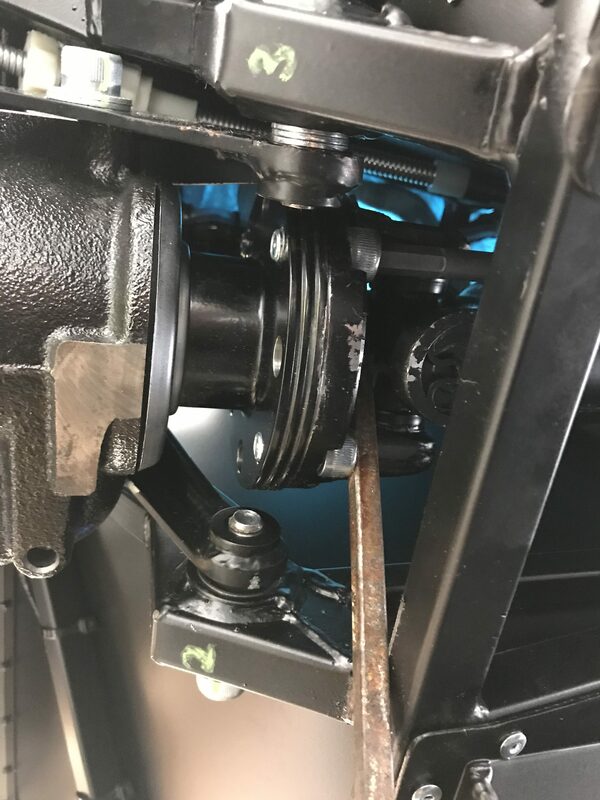 The holes in the diff carrier weren’t aligned with the top mounting bushes particularly well so as I hammered the bolt in, the trolley jack came out again to lift the diff a few mm to ease the alignment. Keeping the washers in place as the single bolt went in was a little fiddly but the copper-ease caked on everything tended to stick things where I put them. A quick check to see if the diff is still centred and we’re good still at 490mm on both sides. That was the end of a Sunday morning getting the differential fitted. It was off to watch Joe’s footie in the afternoon and so the next major session will be on the De Dion tube and the rear suspension. 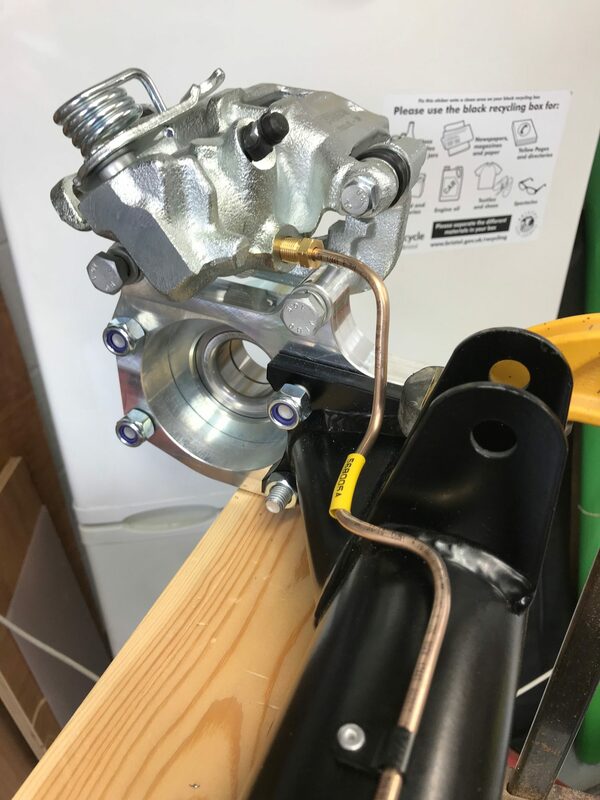 This is a post from the future and a rather technical one at that – so stop reading now if that’s a big turn off for you 🙂 Having got the engine running I thought it would be a useful addition to the blog to have a diagram of the engine water and oil plumbing. The plumbing’s not that difficult in the end but I struggled to get the whole thing in my head from the build manual. Please let me know if I’ve got anything wrong in this post… I’ll be very happy to correct any mistakes or misunderstandings on my part. 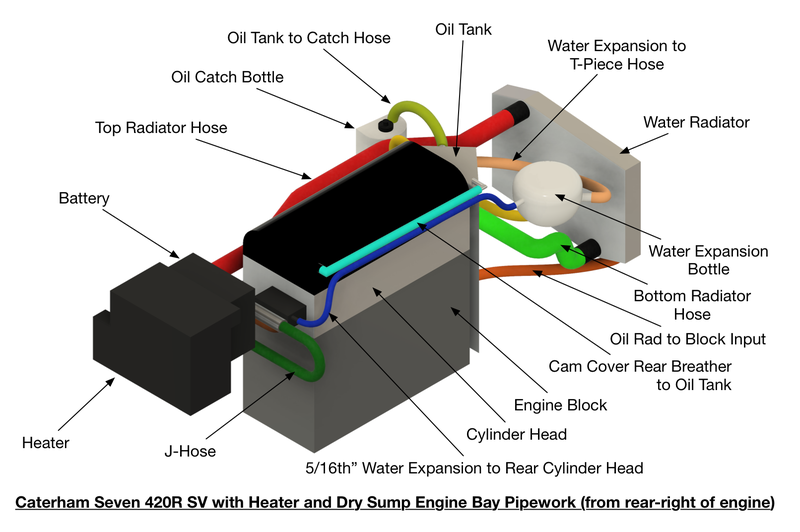 So… here’s an animated 3D CAD model of how the plumbing on our 420R SV, with Heater and dry-sump, ended up. There may be more optimal pipe routing, but this is where we got to. You should be able to click the video to enlarge it on whatever device you’re using. 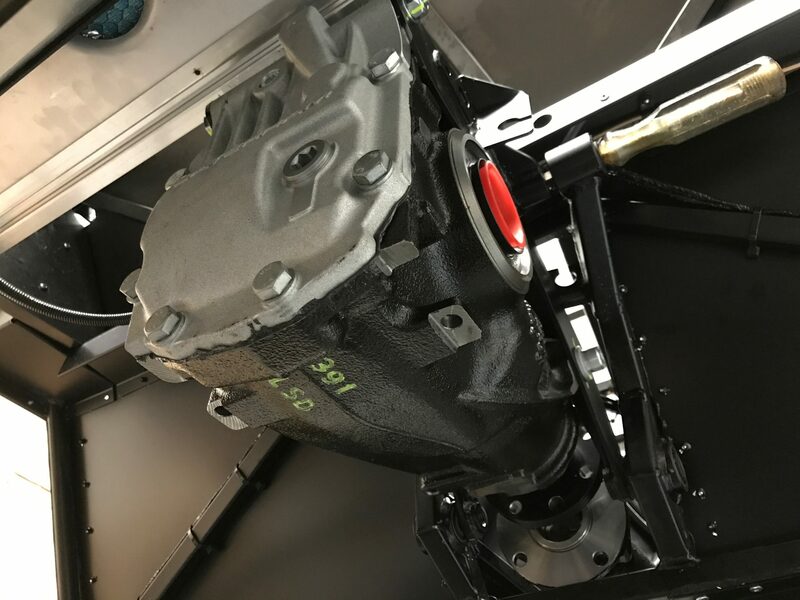 420R With Heater and Dry Sump – Water Circuit. Arrows show water flow. The width of each of the hose boxes is supposed to represent it’s pipe diameter. 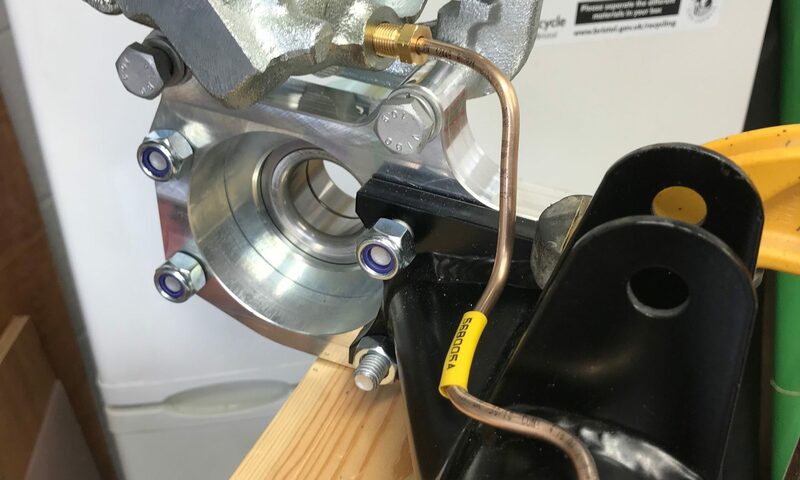 The water heater loop runs from the back of the cylinder head to the thermostat via the J-hose, then the temperature sensor (submarine), the heater (optionally included using the heater control valve) and finally the t-piece. 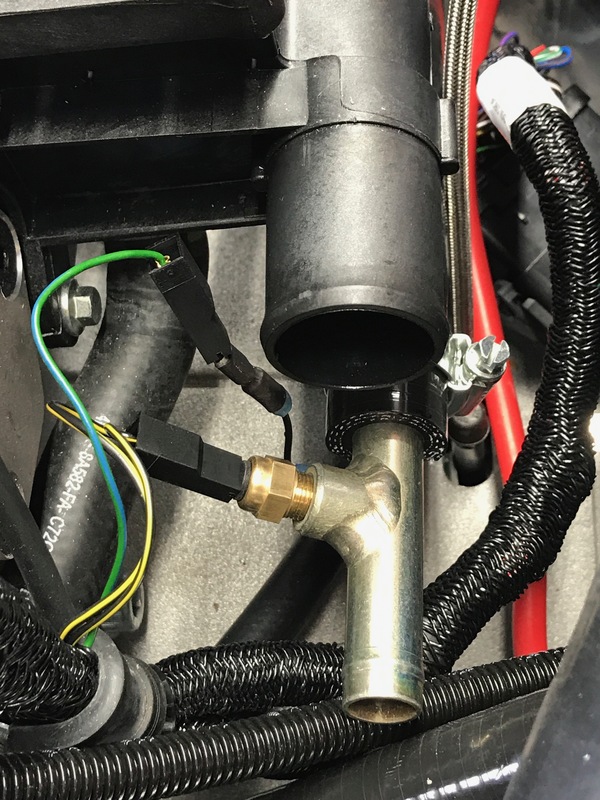 When the driver operates the Bowden cable to open the heater valve, water flows through the heater element. When the heater valve is closed the heater is bypassed. 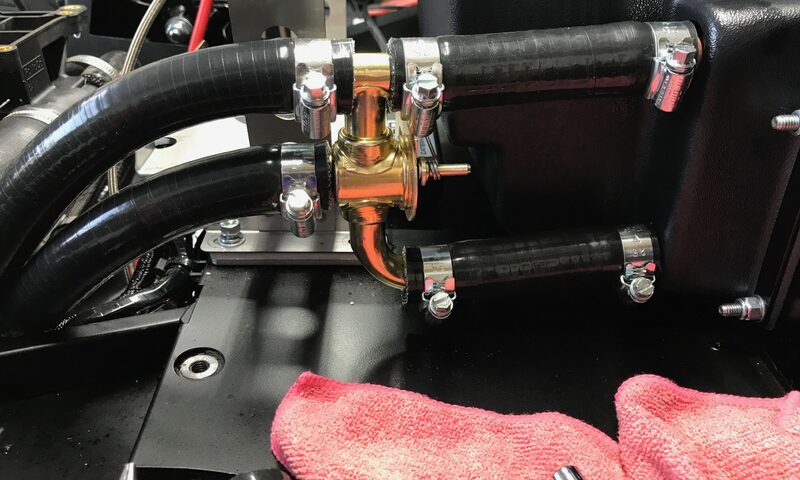 The water expansion loop is in parallel with all the other loops and connects the back of the cylinder head with the thermostat through the 5/16th” hose, the expansion bottle and the t-piece. There is limited “flow” of water in this loop because of the reduced diameter of the 5/16th” hose. This loop is used to provide a compressible air gap in the expansion bottle for hot water to expand into. 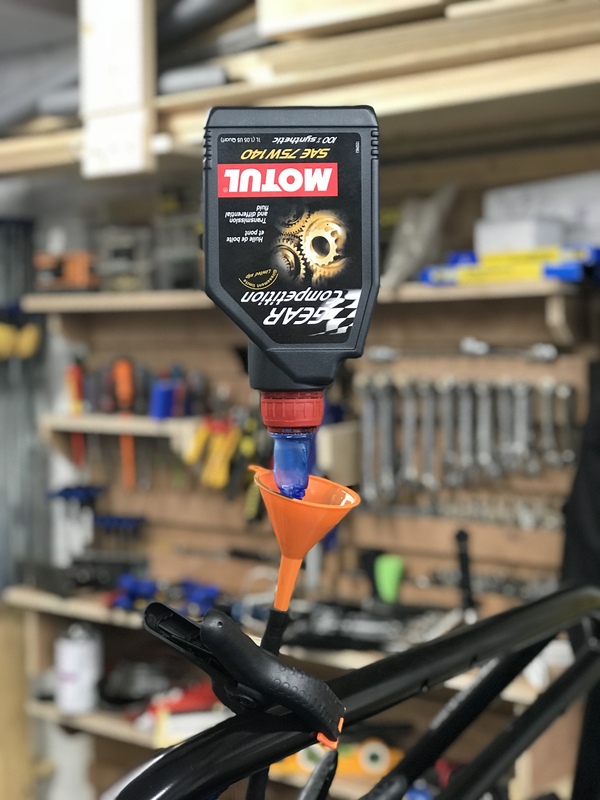 The cap on the water expansion bottle also provides a safety valve in case the water in the engine gets too hot and the cap will vent and relieve the pressure in the system to prevent, for instance, a gasket or hose bursting with excess pressure – not a good situation to be in! 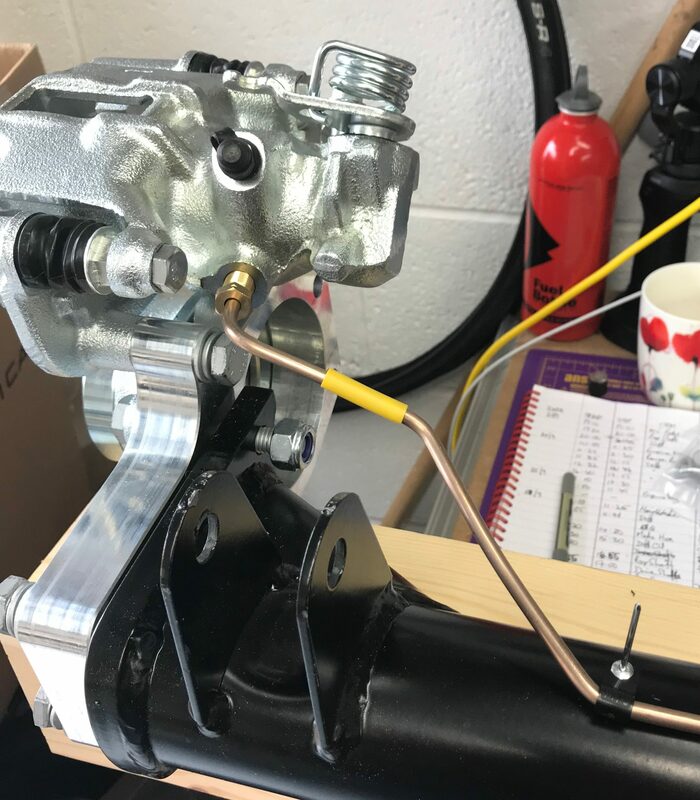 To help getting the engine up to temperature faster and to better regulate engine temperature the Duratec engine has a short hose connecting the back of the cylinder head to the water pump, through the thermostat assembly. 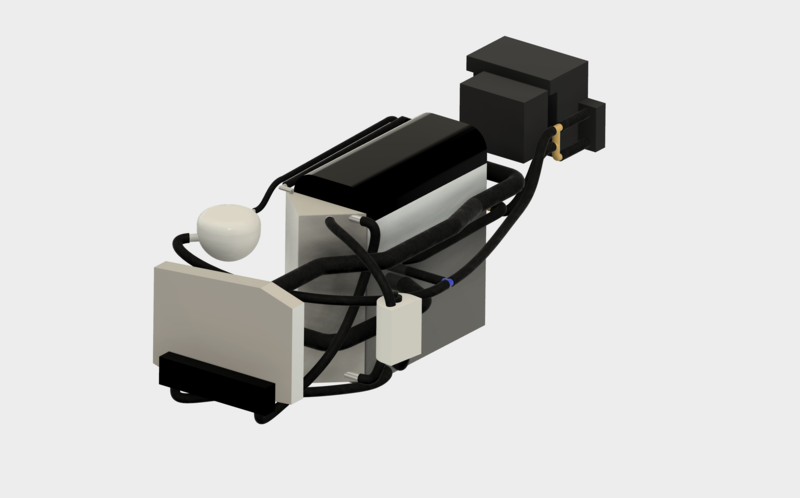 I’ll talk some more about the thermostat later but the thermostat is arranged so that water either flows through the recirculating loop or the radiator loop – the thermostat switches between the two. 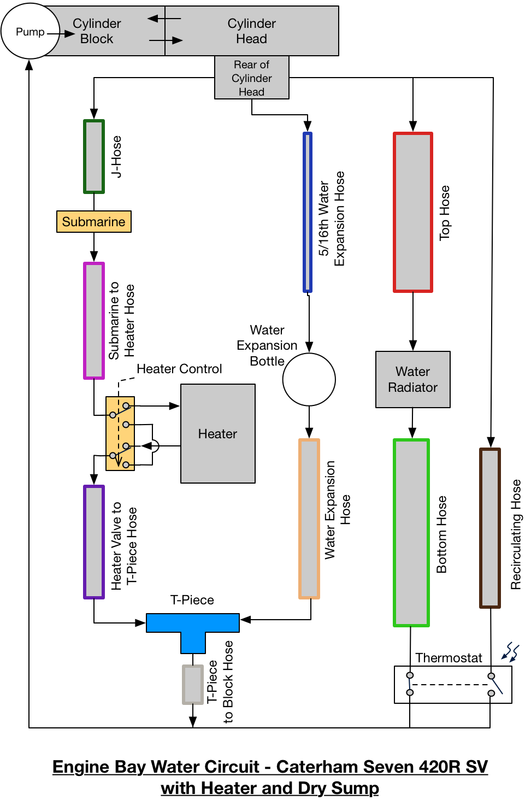 Water flows in the recirculating loop when the thermostat is below its operating temperature and in the water radiator loop when above its operating temperature. This isn’t a binary thing though… It takes a range of something like 10-15C for the thermostat to fully activate. During this temperature range both the recirculating loop and the radiator loop are passing coolant – at varying flow rates dependant upon how “open” the thermostat is. Again, this loop is in parallel with the other three loops but is switched into the circuit once the engine block temperature reaches the thermostat’s opening temperature. Once the thermostat reaches this temperature it’s valve opens and water is allowed to flow through the water radiator. 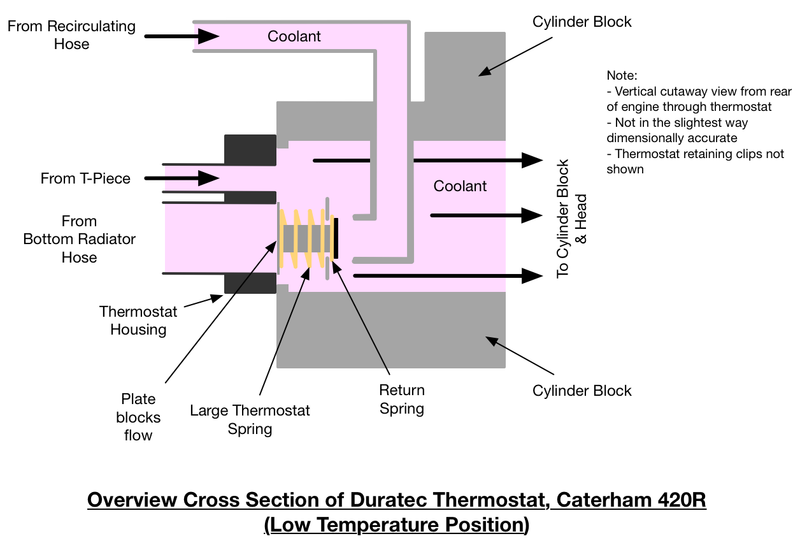 The construction of the thermostat and how its placed in the block effectively switches coolant flow from the recirculating loop (at low engine temperatures) to the radiator loop (at high engine temperatures). Even after the thermostat has “opened” the radiator loop (and “closed” the recirculating loop) water will carry on flowing in the heater loop and the expansion loop. 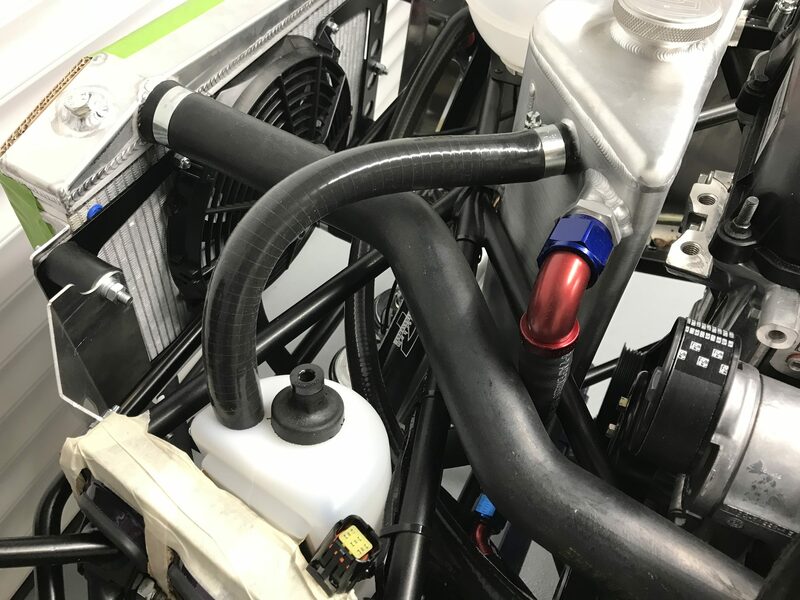 It’s not obvious to me how the relative flow rates change when this happens… the recirculating loop pipe is short and narrow in comparison to the top and bottom radiator hose which are long and wide. 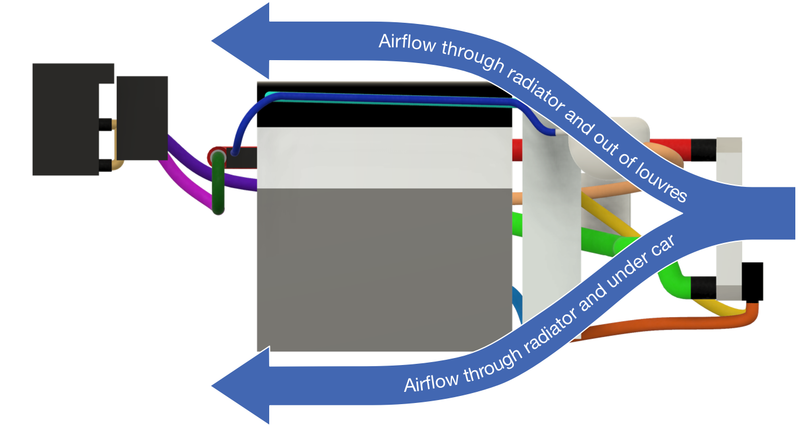 Flow rate is a complex calculation and ISTM that the recirculating loop and radiator loop probably have similar flow rates – therefore not affecting the other two loops when the thermostat is open or closed… but that’s just a hunch (if anyone can suggest a way of proving or disproving that hunch then I’d love to hear from you). What’s the Thermostat Assembly About Then? 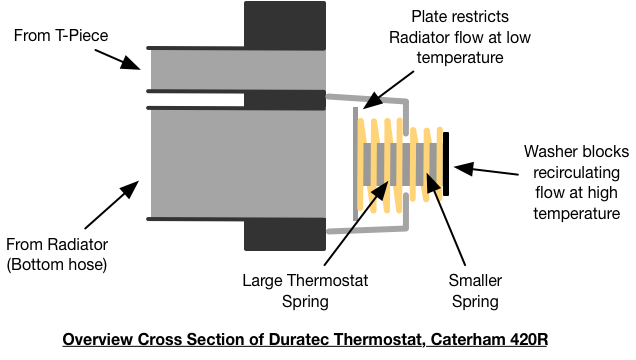 The thermostat assembly on a Duratec engine is essentially a wax operated valve. A pellet of wax operates a valve with two springs working in oposition to the wax. When the wax melts is expands and moves an armature to an open, high temperature position, where the radiator loop is opened and closes the recirculating loop. 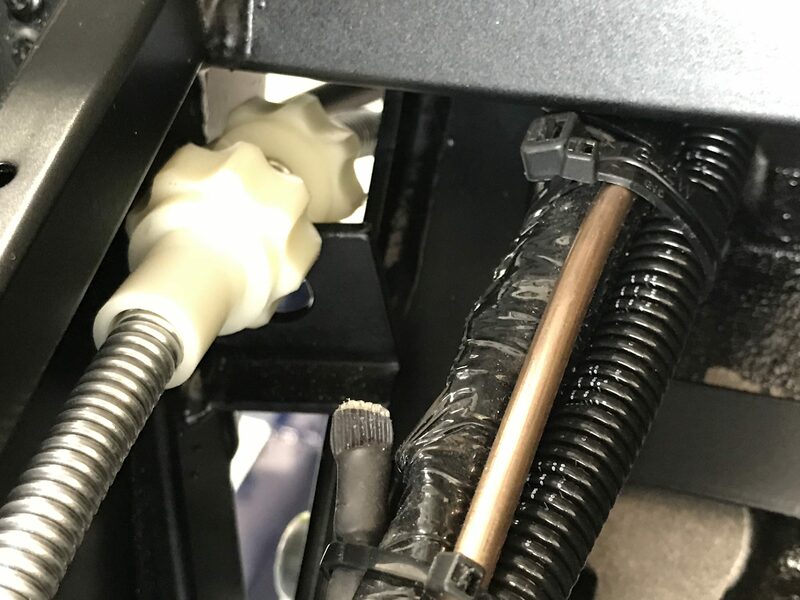 The springs then move the armature back to it’s low temperature position when the coolant temperature drops and the wax contracts when it solidifies. Thermostat and housing (courtesy Caterham). This unit is lying on its side. The small pipe on the left sits at the top when installed and takes water from the t-piece. The larger pipe on the left takes water from the radiator. Recirculating input – this one’s a bit odd. There’s a pipe feeding into the cavity behind thermostat housing but which is not part of the assembly shown in the picture above. This pipe is part of the cylinder block. The flow from this pipe is either allowed or disallowed by the operation of the thermostat. 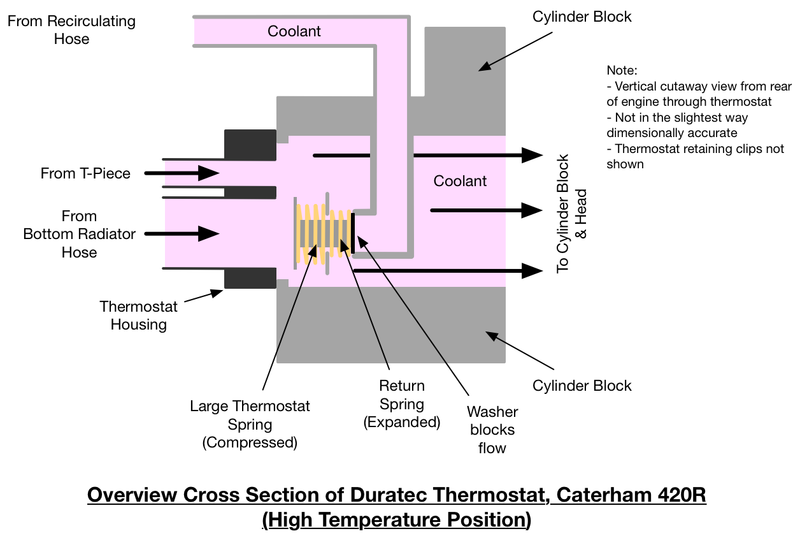 When the thermostat is in the high temperature position the flow of coolant from the recirculating pipe is closed. When the thermostat is in the low temperature position, recirculating flow happens. 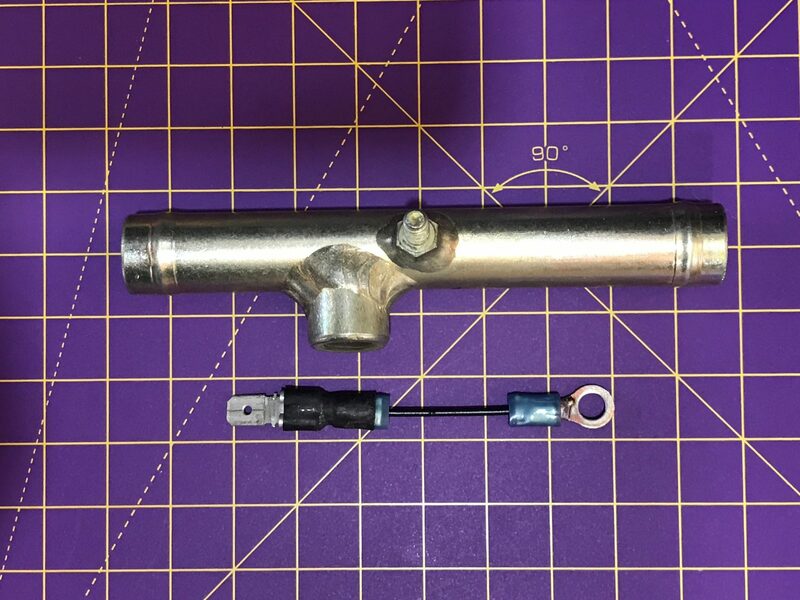 Radiator Loop input – this input to the thermostat comes from the larger of the two pipes on the outside of the thermostat housing. 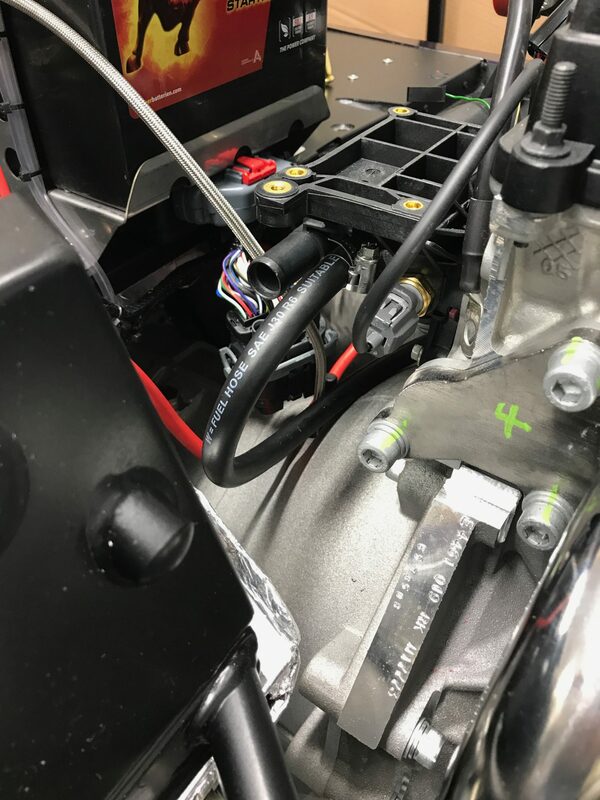 When the thermostat is in it’s high temperature position, coolant is allowed to flow through the radiator into the thermostat cavity and then on into the block and head. Thermostat output – while there looks to be no output from this assembly, when it’s installed in the block a cavity is formed between the thermostat housing and the inside of the block. 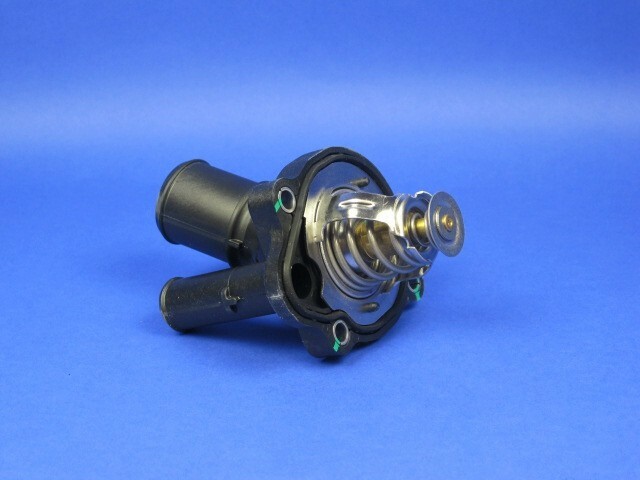 This cavity, leading to the rest of the engine, essentially creates an output from the thermostat assembly. Below are two diagrams, one showing the arrangement of the thermostat in it’s low temperature position and one diagram showing the arrangement in it’s high temperature position. It takes 10 to 15 degrees C for the thermostat to move between the two states. Now lets add the thermostat and housing into the cylinder block and see what happens at low then high temperatures. At even higher temperatures than the thermostat operating temperature, the water radiator fan turns on to provide cooling. The fan is only needed when the car is stationary or in slow traffic – because a moving car will have more cooling provided by airflow through the front nose-cone grill than the fan can deliver…. there’s a lot of air flow with a car travelling at say 20mph, try that speed on a bicycle to test the difference between that speed and what the water radiator fan can do. I’m no aerodynamicist but it seems clear that as the car is moving forwards air passes through the radiator and then out from the engine bay from under the car or through the bonnet louvres. There is of course some sort of “wing effect” going on and it wouldn’t be surprising to find there’s positive upwards pressure under the engine bay and so the louvres are more effective than might otherwise be thought. It will be interesting to put pressure sensors on a car and see what they can tell us about these air flows. 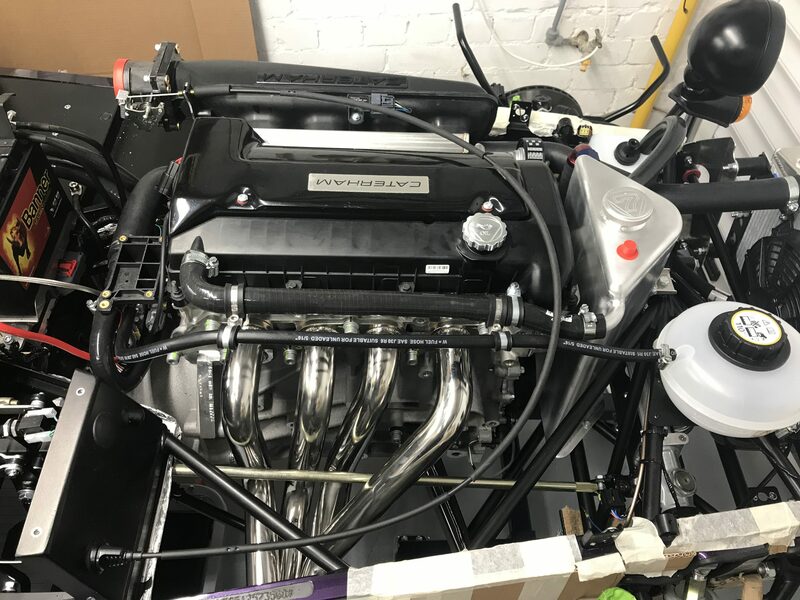 The fan on a Caterham generates an airflow of around 1360m3/h (when the car is stationary – from the SPAL website), or 0.3778m3/s. Now, the frontal cross section of a Seven 420R radiator is approx 430mmx195mm (I’ve removed any area associated with the oil radiator which I’ll discuss later). This works out to be an airflow of 0.0839m3/s at 1m/s, i.e the volume swept by the area of the radiator at 1m/s. So, at what speed does forward motion of the car work out to be equivalent to the fan throughput, well that’s just the forward velocity of the car when it reaches the same throughput as the fan… ie. 0.3778/0.839 = 4.5m/s or approx. 10mph. So a car travelling above 10mph will have more cooling effect coming from its forward motion than from a running fan. As you can see the fan is only really needed at very low speeds. Sure, when the fan is on it is helping the cooling but even at slowish speeds of say 30mph, the fan is doing less than 25% of the work – not to mention that the fan’s effectiveness reduces significantly if air is being forced past it (I haven’t done that calculation but there’s going to be a speed at which the fan actually stops providing any cooling effect and in fact will start to just reduce cooling because its getting in the way). What this calculation doesn’t take into account… I haven’t taken into account the following, partly because I didn’t think it affected the figures or because the same restrictions apply to both the fan and forward motion throughputs. The oil radiator is both restricting air flow but also adding additional heat to the system. The difference in area of the fan vs the overall area of the radiator. This is probably less than you’d think because of edge effects at the far edges of the radiator in forward motion – the centre of the radiator will have better air flow and therefore both the fan and forward motion may have the same effective cross sectional area. All in all, my finger waving, back-of-a-fag-packet calculation could be wildly out, say +50%/-%200. But, I hope, the reality is that these calculations show that even at relatively low car speeds the fan is not going to be doing a great deal to add to the cooling from the car moving forwards. I hope I’ve managed to a) get my had waving calculations right, and b) been able to explain it in reasonable terms for you all to understand. If anyone knows a better approach to these calculations or can suggest where I’m going wrong then please leave a comment and I’ll do my best to update this page – the last thing I want is for this to be worth less than the paper its printed on :-). The oil circuit is much, much simpler than the water circuit. Oil is scavenged from the sump and sent to the top of the oil tank through the oil radiator. Oil is then taken from the bottom of the oil tank back into the sump’s oil input. Simples. PS: Big thanks to Andrew Pepperrell for being a guinea-pig with these diagrams and being so positive. 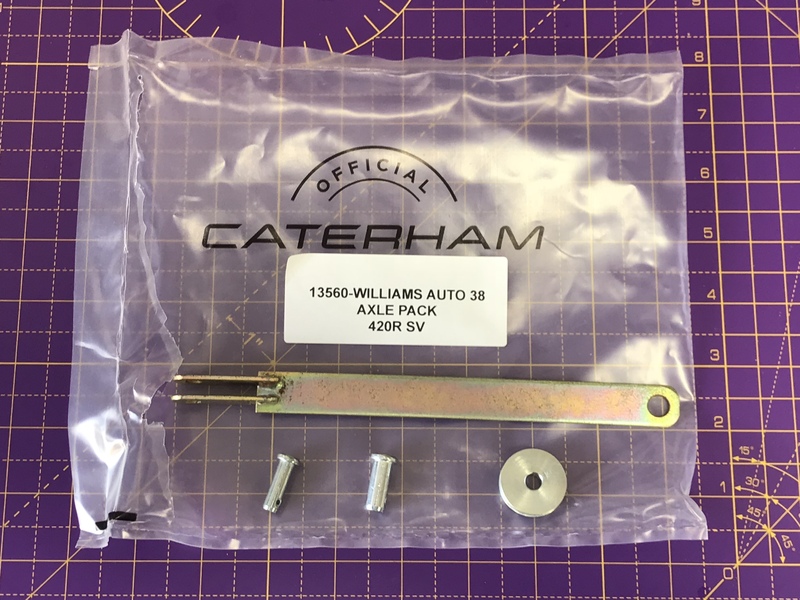 Also, thanks to all those who commented on the Caterham Techtalk Facebook group and made suggestions. Now back from the US and the after effects of hurricane Irma… I have some more time to get on with the build. I’d left the project at the point where I really needed to get on with the engine bay plumbing and I’d laid all the hoses out in the engine bay prior to the trip. The 5/16th” water expansion bottle hose was missing from the kit but while I was in the US I’d emailed Derek and the hose had arrived while I was away… so first task was Water Expansion Bottle. 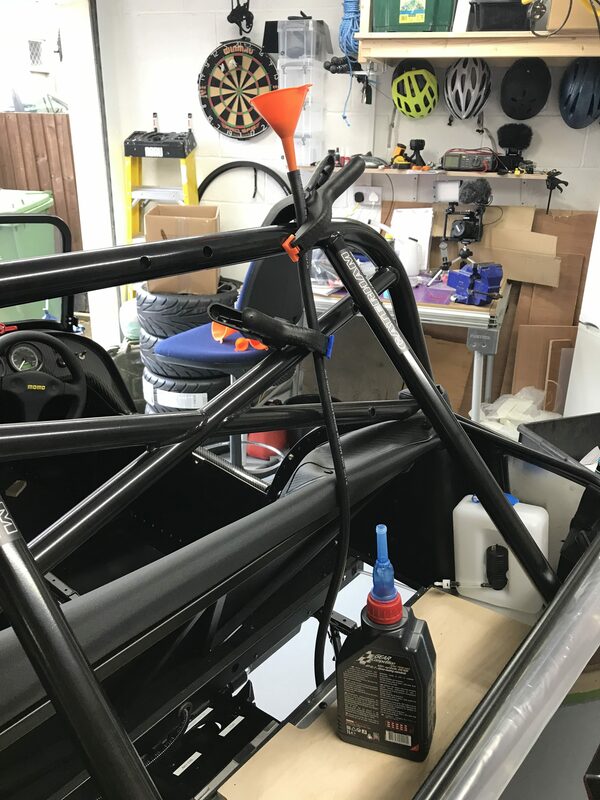 I’d mentioned before that I wanted to get the bracket for this bottle sorted in my mind and where it was going to go – that had led me to test fitting the bonnet and the nose cone to test that where I wanted to the expansion bottle was going to fit under the bonnet. So, now I have that set I drilled the holes for the rivets (no rivnuts here) and removed the cable ties that are going to get in the way. I’ll have to re-tie the cables later. I decided that I wanted to the rivets to sit vertically on the rails and not have to drill diagonally into the rails. That meant I had to open up the two outboard holes in the bracket. I’d set the bracket on the chassis rails so the inboard holes could be left alone, but that meant slots needed to be created in the outboard ones. Water Expansion Bottle bracket riveted in place. You can just see the elongated holes in the outboard (right) holes but the rivets are upright. The dremel slipped on the top right hole – that’ll need some hamerite later. Now for another conundrum… or two conundrums actually. Firstly, what orientation should the expansion bottle be. Secondly, where to route the 5/16th” cable from the water bottle to the back of the cylinder head. In most of the builds I’ve seen, the water expansion bottle is placed so that the 5/16th hose comes out directly rearwards. That means the main water hose can come out of the front-right of the bottle towards the front right chassis corner. However, while this config means the 5/16th hose routes easily across the top of the hot side of the engine, it also means the main water hose has to bend a long way backwards to get back across the front of the engine bay. The other complexity here is that he build manual talks about routing the 5/16th” hose around the front and then the cold side of the engine and then back around the back of the engine. That makes sense I guess, the primaries are going to get really hot and any water in the 5/16th hose is going to be really really hot as it sits in that pipe. Hmmm. So, I decided to site the water bottle with the 5/16th outlet pointing directly rearwards. However, I would try routing the hose as suggested in the manual… easier to do this while the hose was long rather than cutting it down and then realising I wanted it routed differently ;-). Now to route the hoses and see what I think of that. Hmmm… if using all the hose up was an objective, then I certainly achieved that. 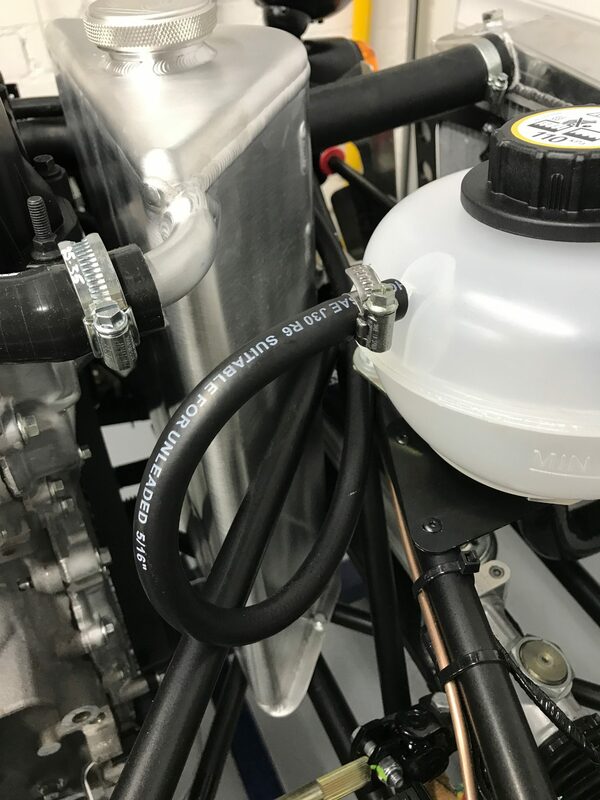 The other thing to add to the equation here is that I’ve seen posts and pictures of Caterham built cars where some of this 5/16th fuel hose (it’s actually labelled as fuel hose) is used as a shroud for the braided clutch hose and also in some cases to protect the rear brake hose from abrasion too. Hmmm… (again)… I’m going to need to re-route this 5/16th hose around the hot side I think and give myself some spare hose for other tasks. Time to fit the heater… I’d had it sat loosely in the car for a couple of weeks but it was now time to figure out how the plumbing was going to work and how the heater control valve gets connected up. First job was to finally bolt the heater in place. Heater bolted in and retaining bracket included. In order to get the heater pipework in I decided I needed to get more of the rest of the plumbing in place too. It was a case of “a bit here, a bit there”. Next I installed the T-piece that goes into the water inlet on the front of the engine. Water T-piece needs a short length of hose from it to the engine block. Here’s the water T-piece installed on the LHS of the engine. The left hand pipe runs to the water expansion bottle, the right goes to the top connection on the heater control valve. Next up I need to work out how the J-hose runs from the back of the cylinder head (next to the 5/16th expansion bottle hose) and connects to the lower heater control valve connection. This run of hose also needs to get cut and the water temperature (submarine) inserted inline. So… now I need to figure out where to position the submarine. Run the LHS of the submarine to the lower heater control valve port. I’ve seen various people post about how to connect the earth (threaded post) to the spade connector (green and blue lead) on the loom. My kit also came with the temperature sensor connected but dangling on the spade connector (black and yellow lead). 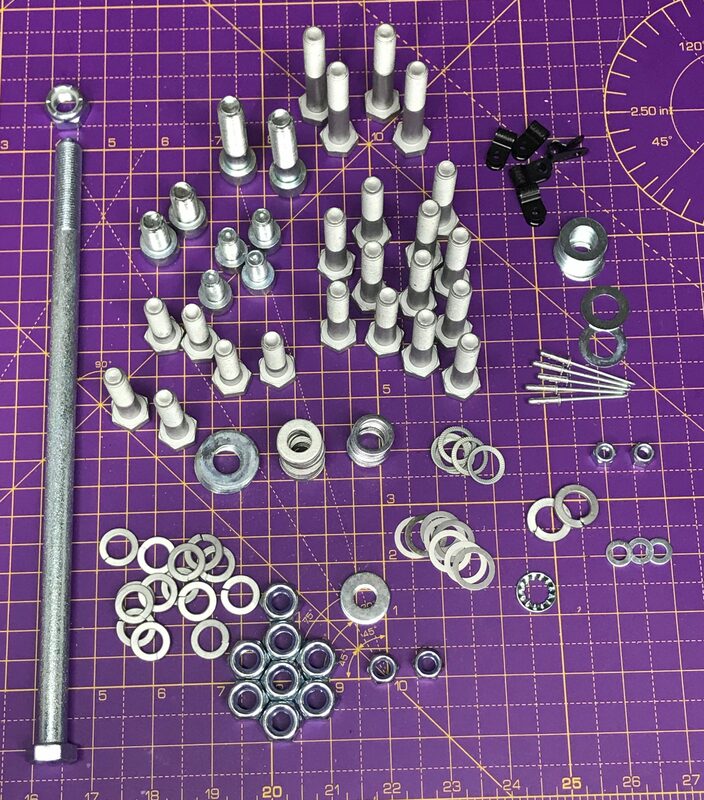 I searched the kit for something that would allow me to put a ring terminal and spade connection onto the earth threaded post but I couldn’t find anything. I didn’t want to bother Derek with this one so made up my own lead with a crimp tool. 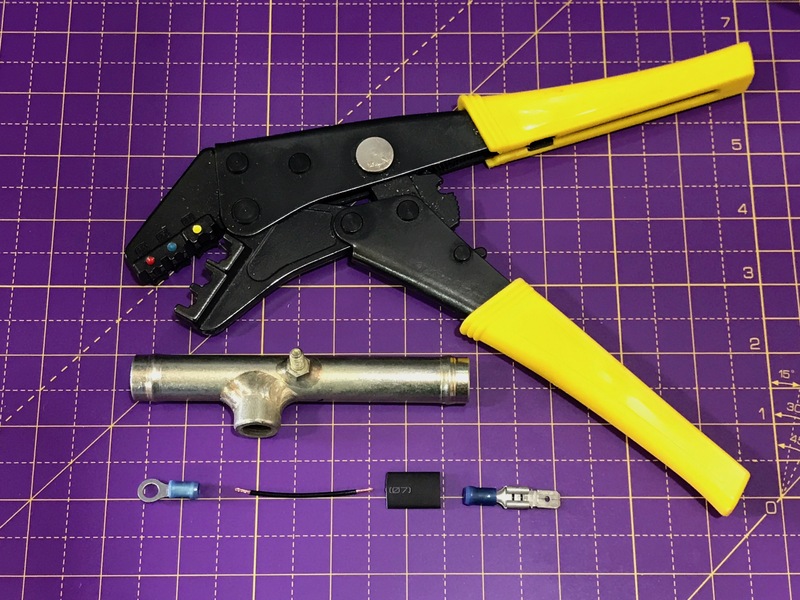 Crimp tool and components to make an earth connection for the submarine. I made do with what I had in my parts bins. And this is what the lead looked like when it was finished. At this point we have the hose from the expansion bottle connecting through the T-piece. And we have the J-hose feeding underneath the back of the cylinder head and through the submarine. The next task is to put the heater control valve in place and hook up these two connections from the submarine and T-piece. 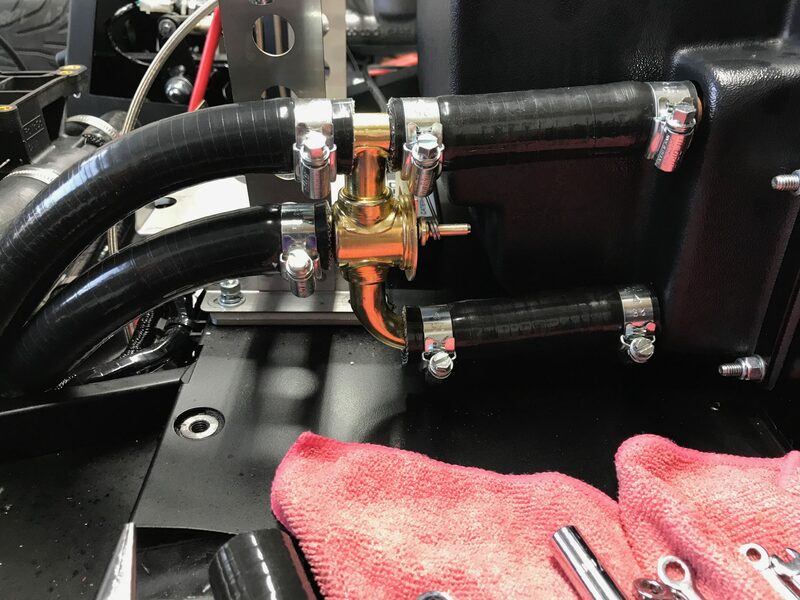 Heater control valve in place and hoses connected. 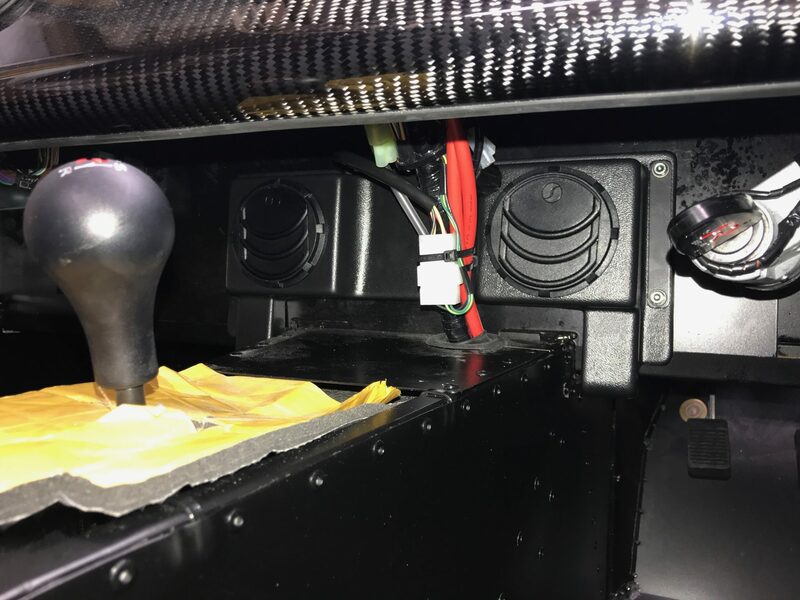 The heater valve needs to be placed so that the control cable, running to the driver’s side firewall, needs to pass between the battery and the heater blower assembly. Once I’d got all the hoses connected to the heater valve I wasn’t so keen to take them all off again. So… to get the control cable attached to the valve I found it easier to take the battery out and give me better access to the screw and clasp that the cable route to. Heater control cable routes from the bottom left of this picture to the valve. Connections seemed easier with the battery removed. One oddity was that the screw on the clasp retaining the cable shroud seemed to be an odd size. It was bigger than a 6mm spanner but smaller than a 7mm. I ended up grinding a 6mm spanner to size. It’s probably imperial but I don’t have imperial spanners that go that small. 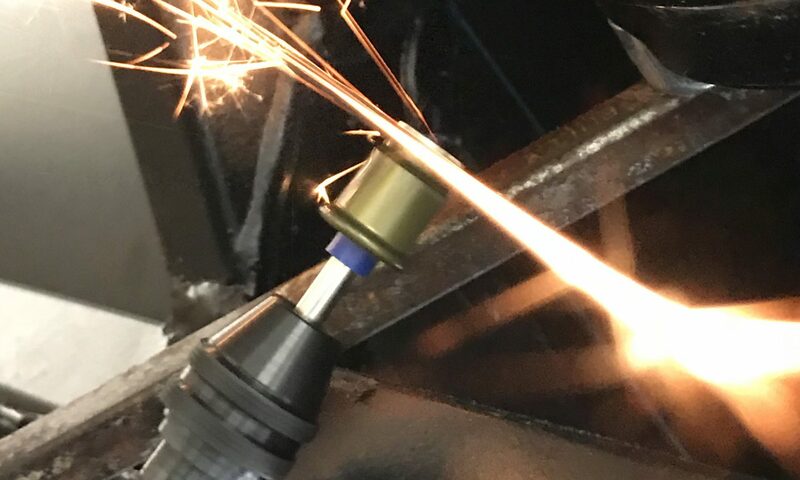 It was simple to install the heater control knob into the firewall on the driver’s side. While I was thinking about plumbing I tightened up the oil hoses to/from the oil radiator, block and oil tank. Some of the hoses were a little tricky to get to at this stage of the build and getting a torque wrench onto them was even trickier. The crows feet spanners came in handy with a mix-up of extension bars thrown in for good measure. 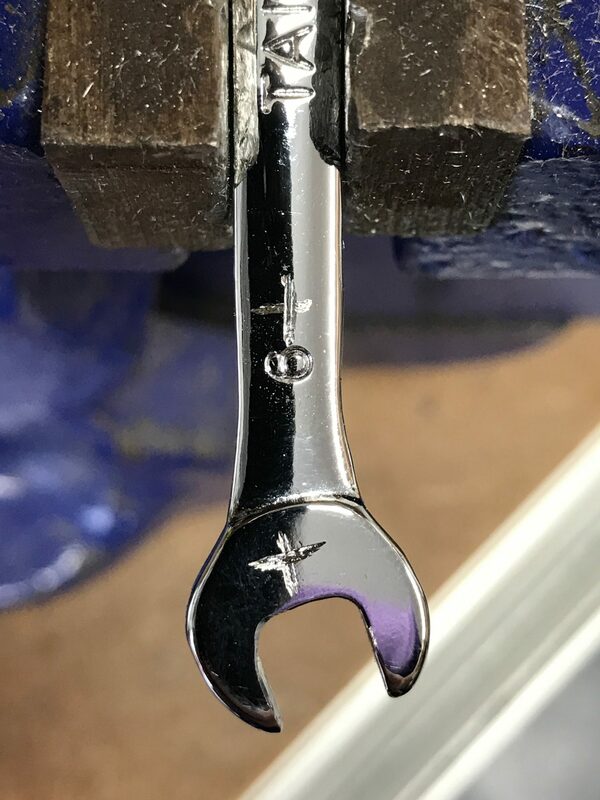 Once I needed to torque the oil hoses I derated the torque values on the wrench by the 5% fudge factor required because the centre of rotation of the crows foot increases the effective length of the wrench by 5%. This calculation only works if the crows foot is as in the photo above. If the crows foot is 90° to that shown in the photo then there’s no fudge factor needed but that’s not always the right configuration for the space you have. That was the end of the day and most of the engine bay plumbing done. It’ll be working towards the rear of the car tomorrow with the prop-shaft and diff hopefully being fitted.